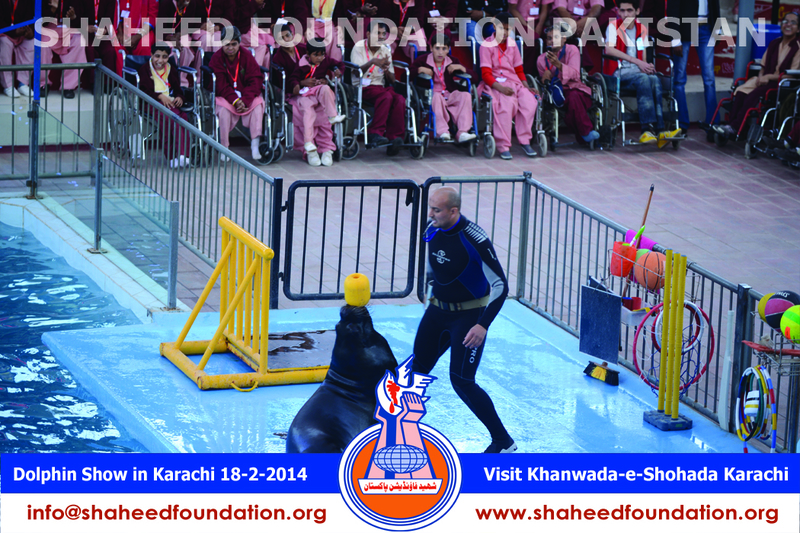 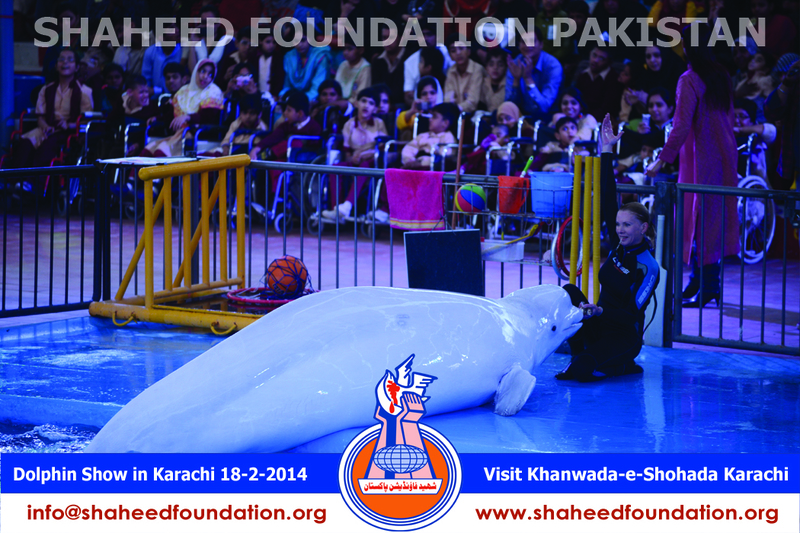 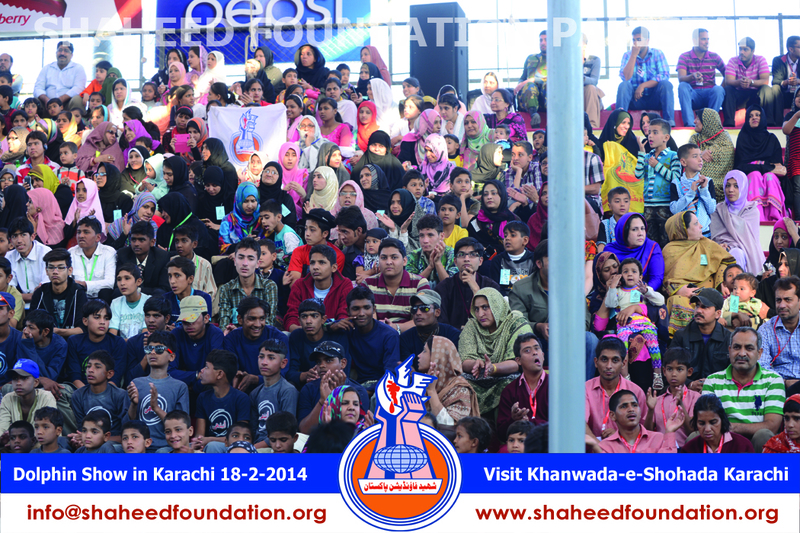 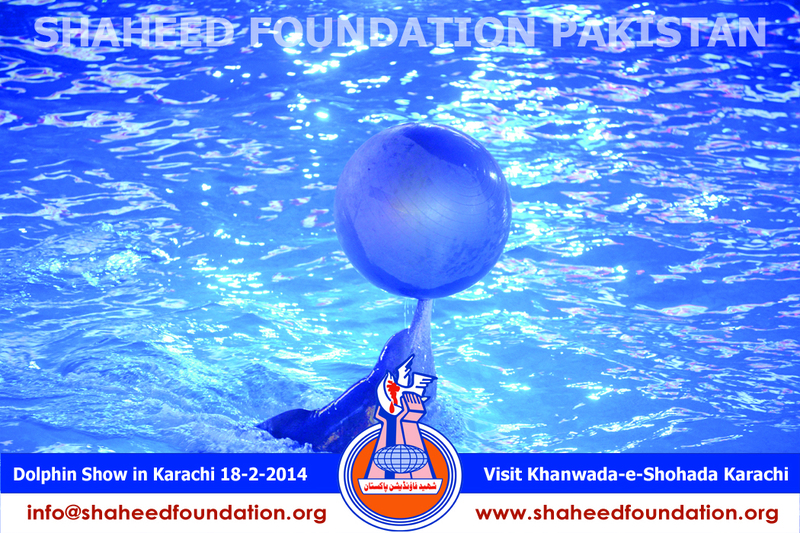 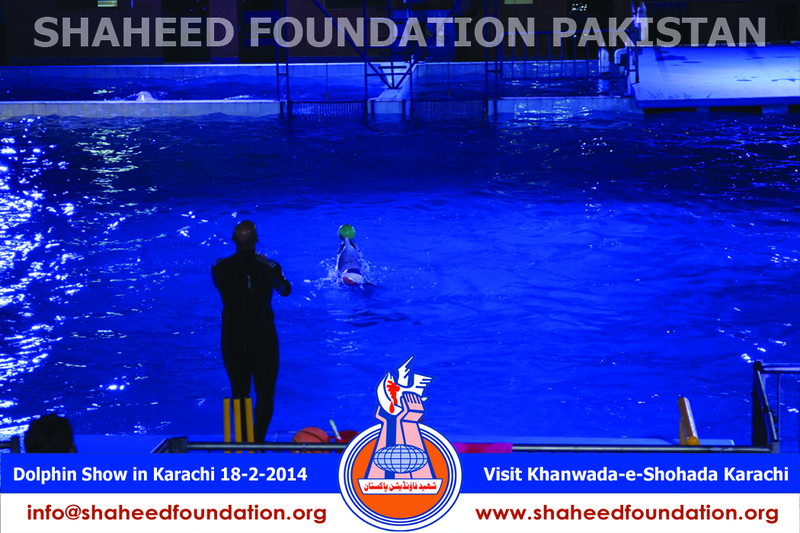 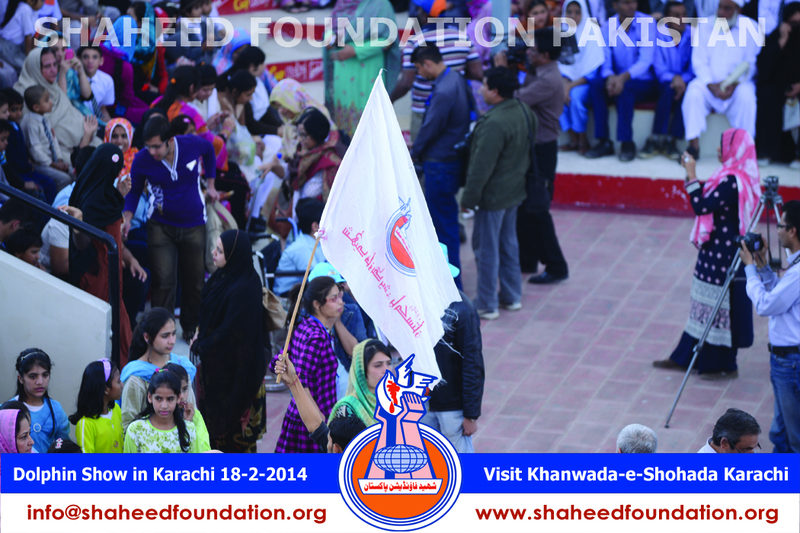 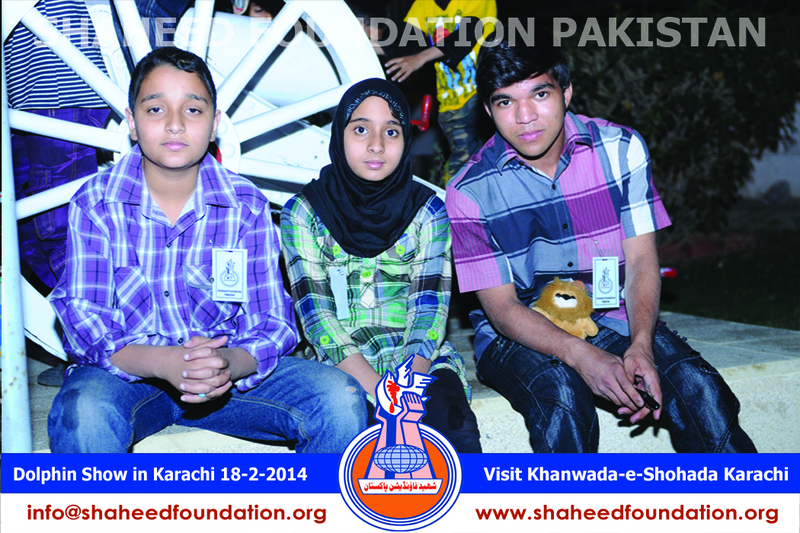 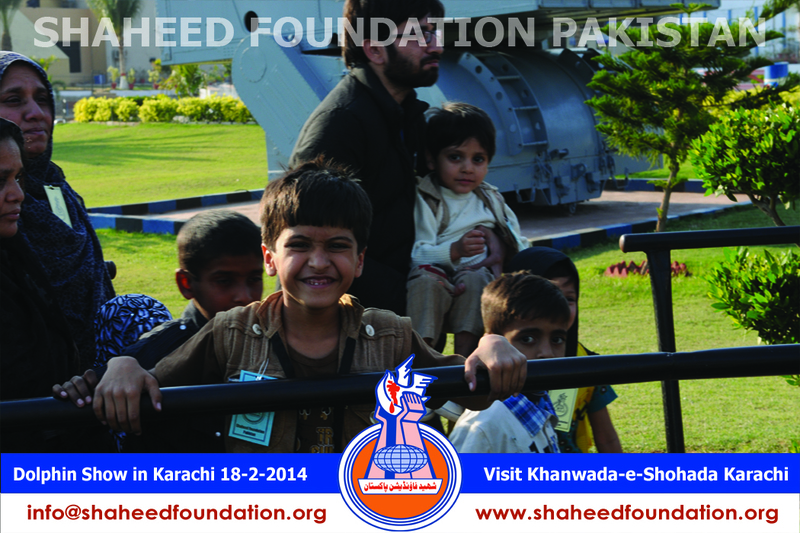 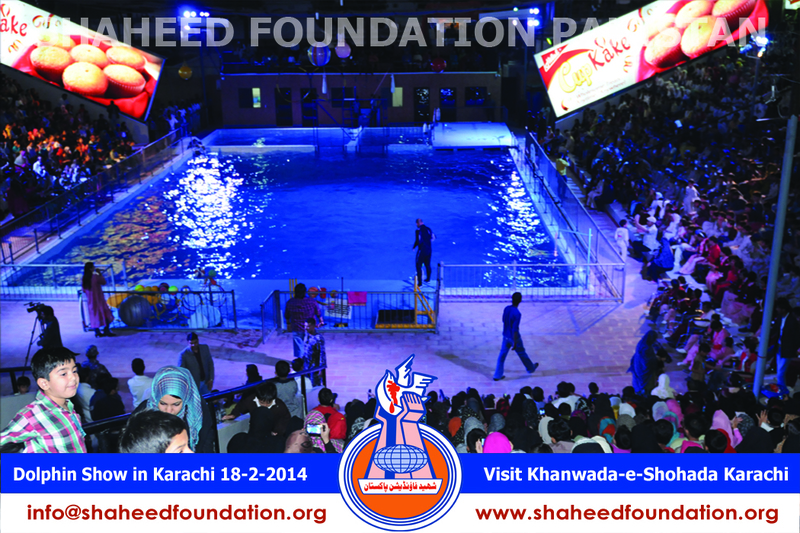 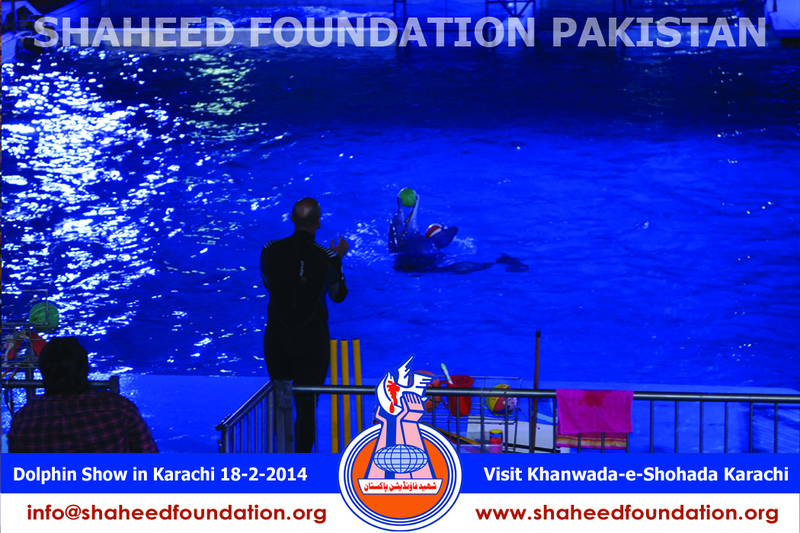 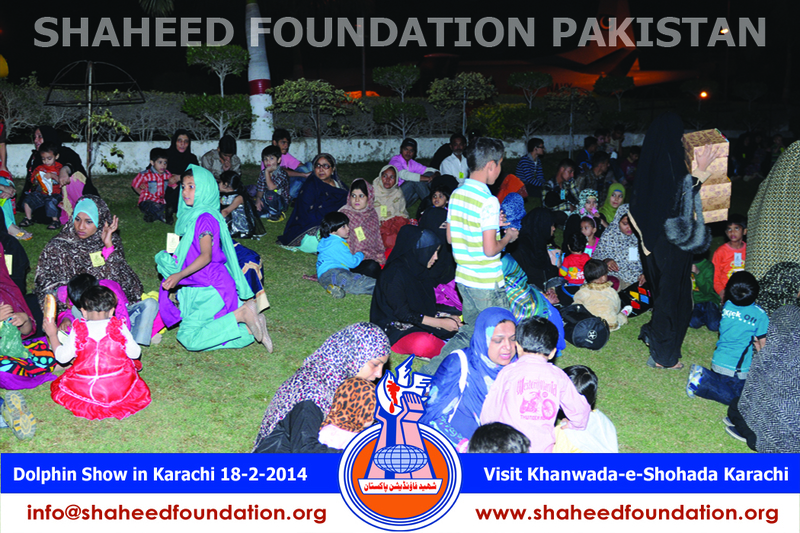 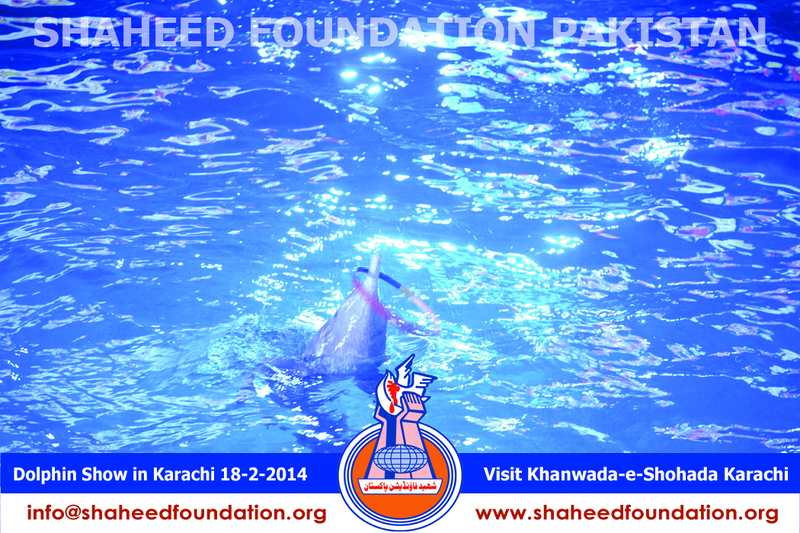 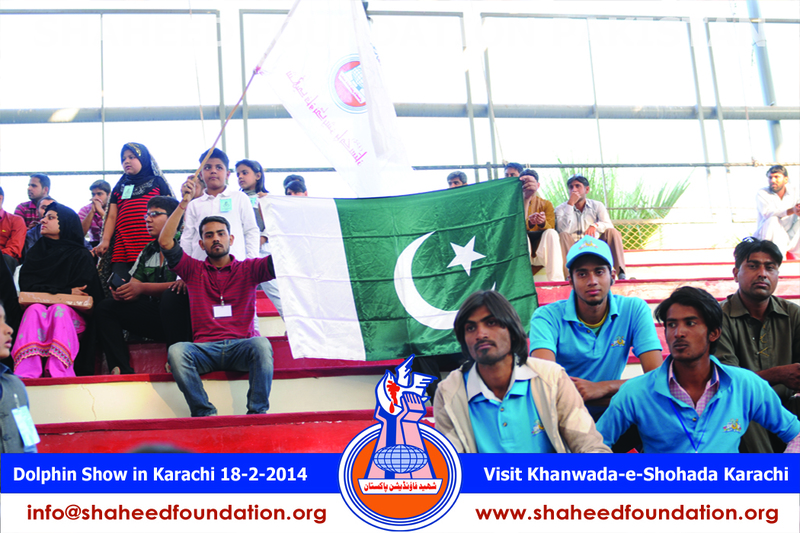 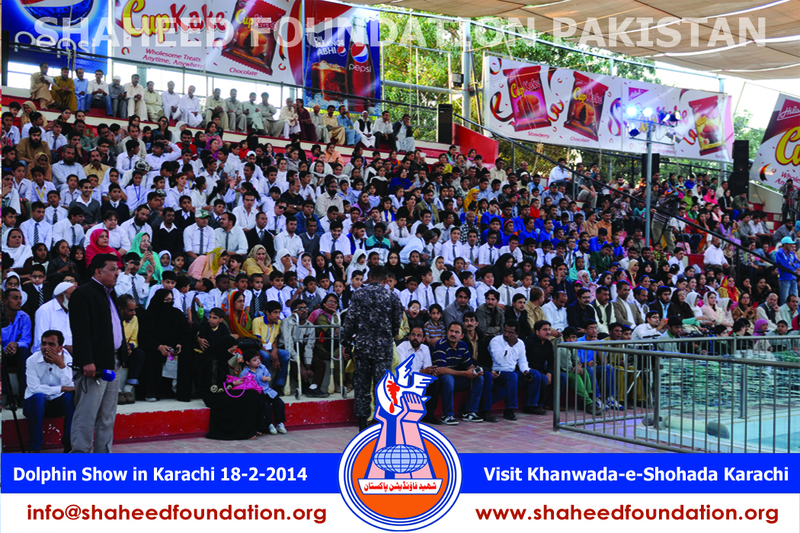 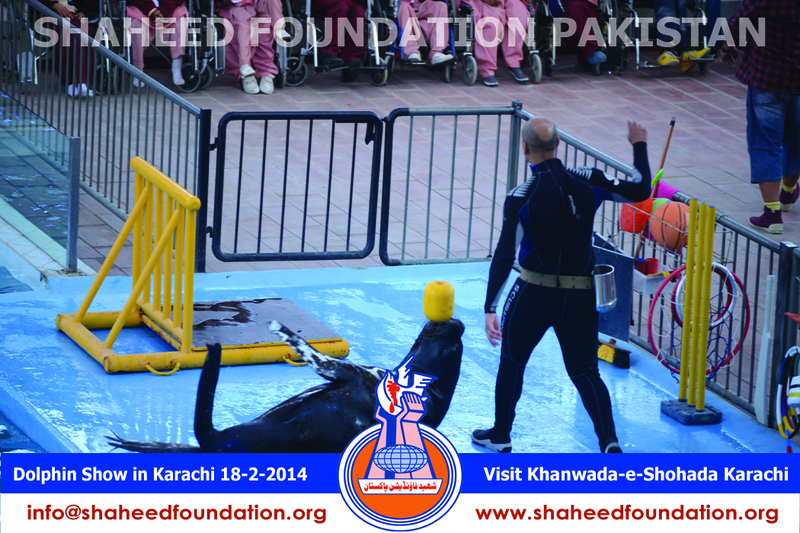 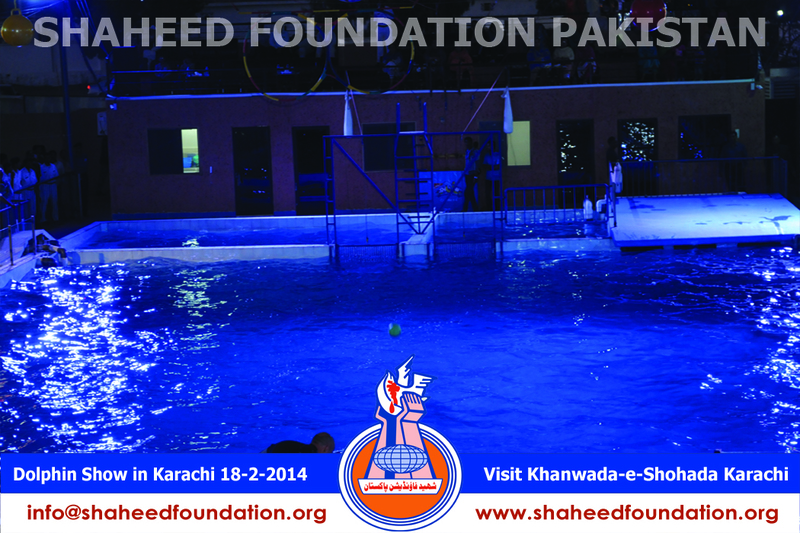 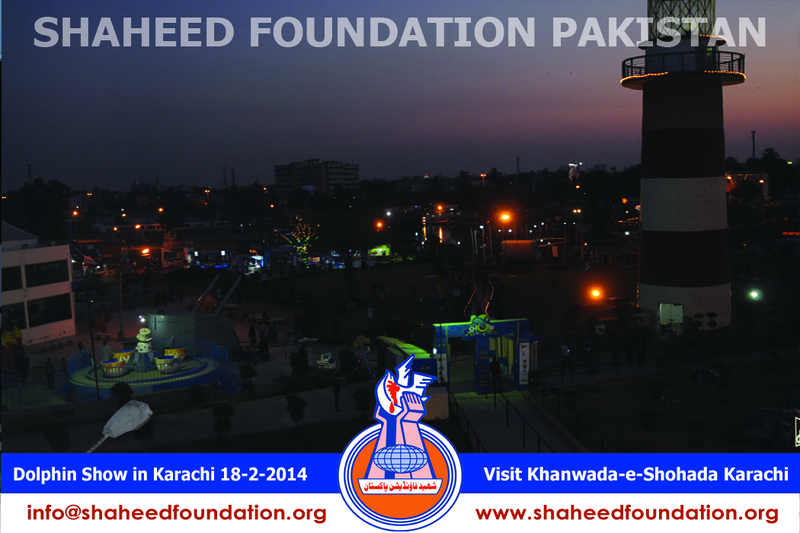 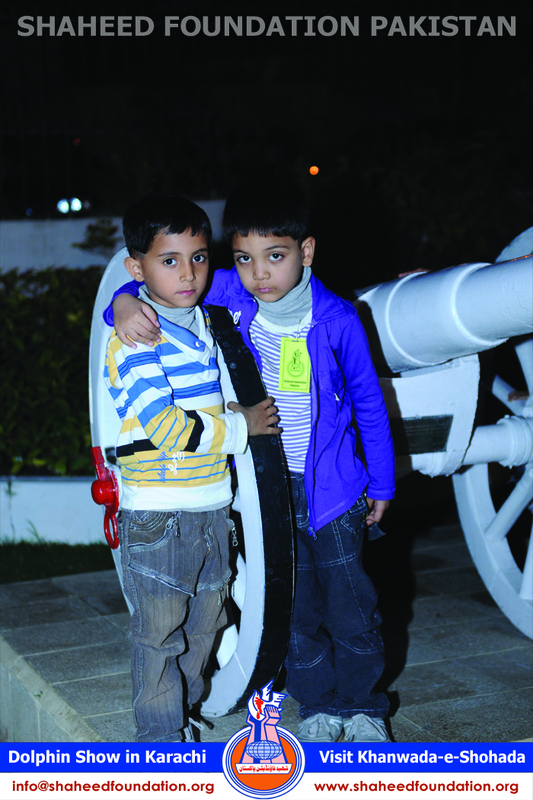 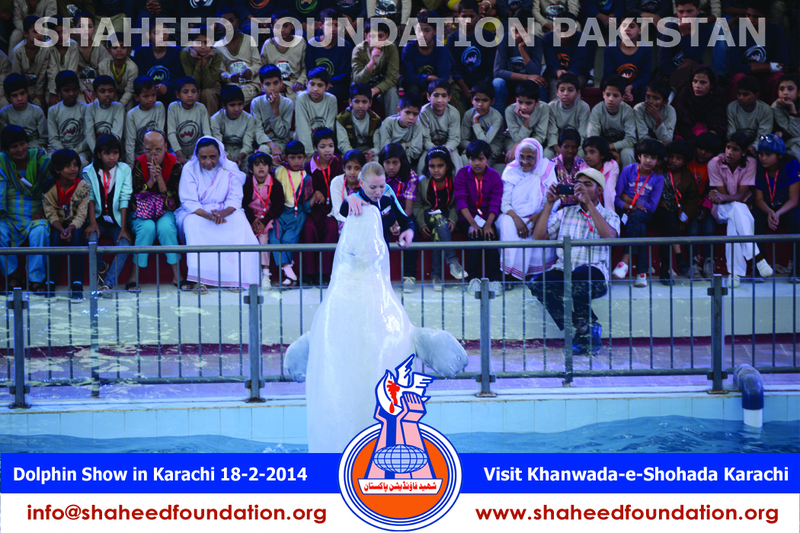 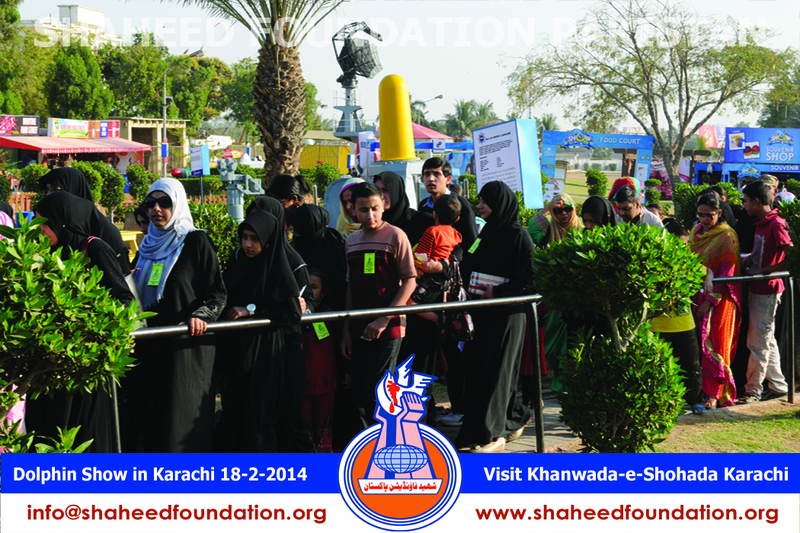 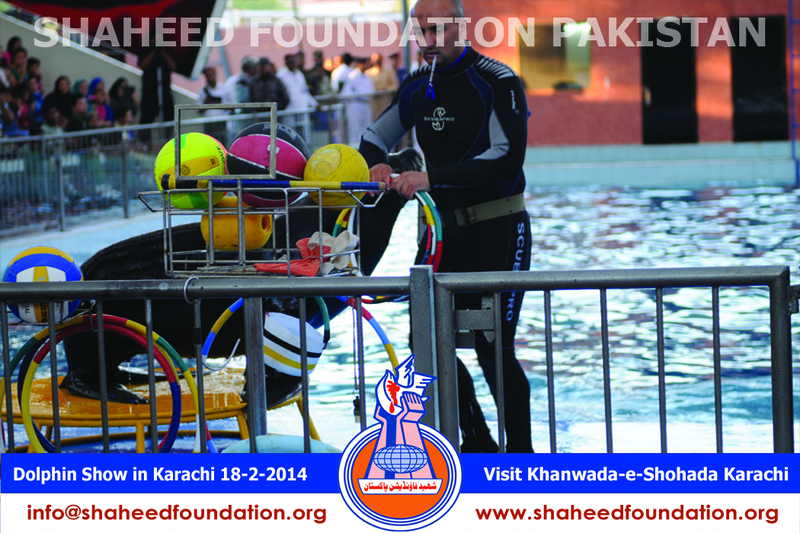 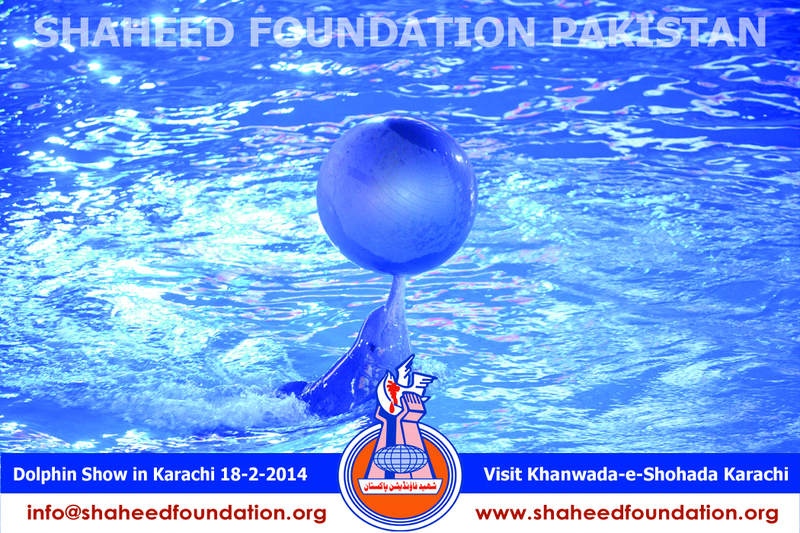 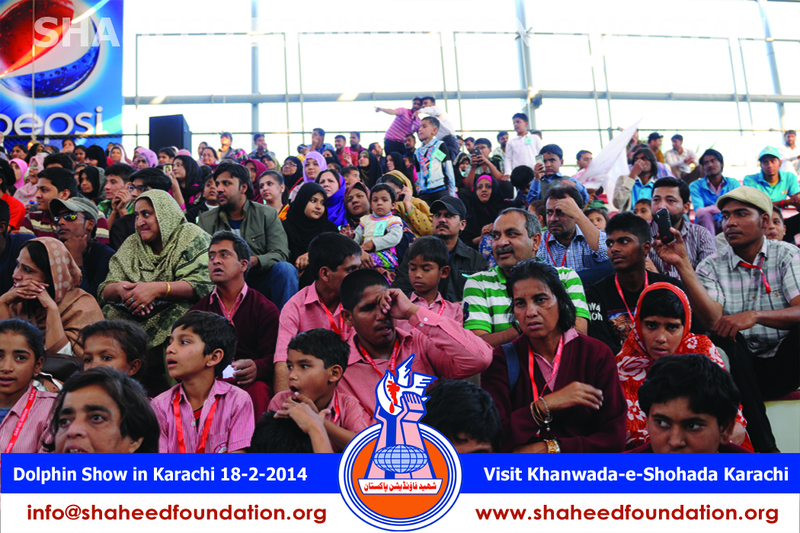 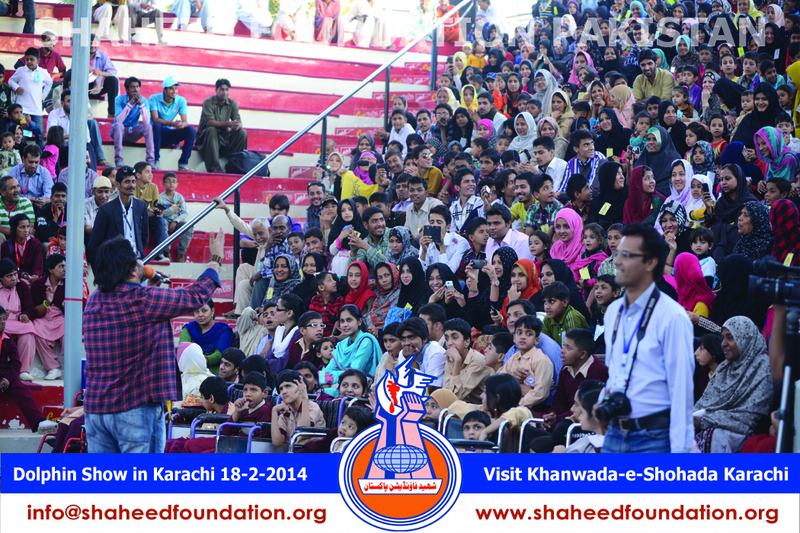 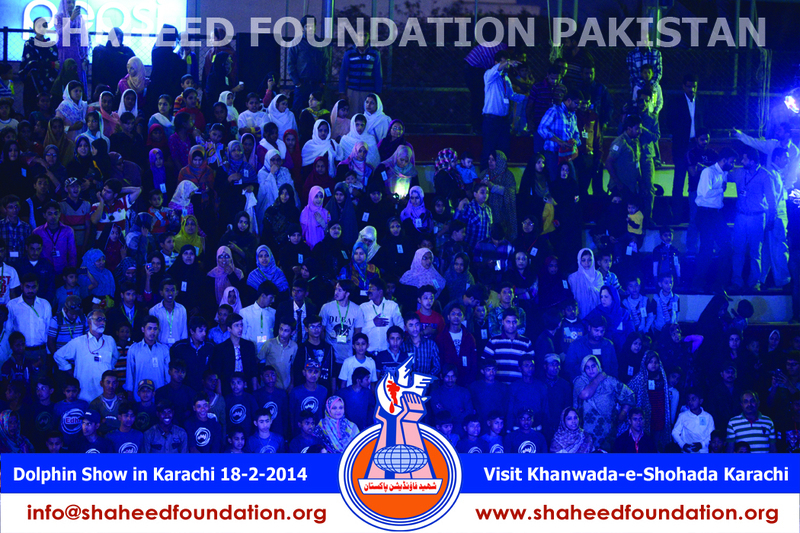 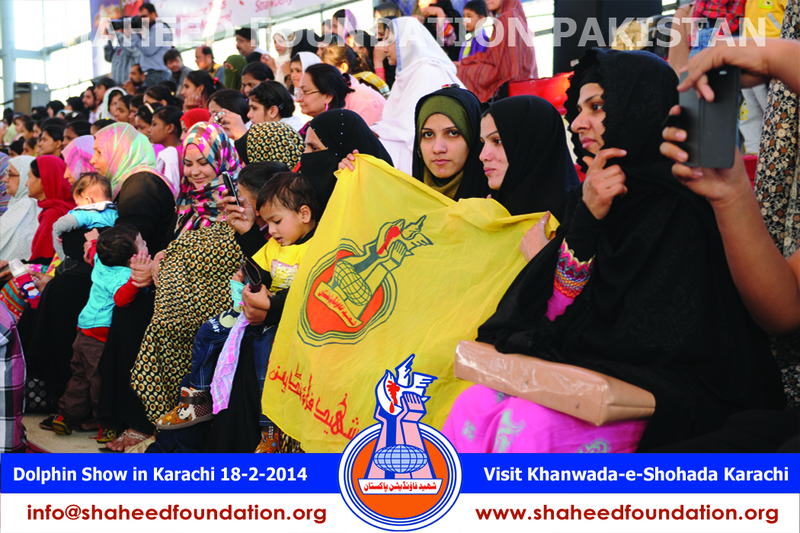 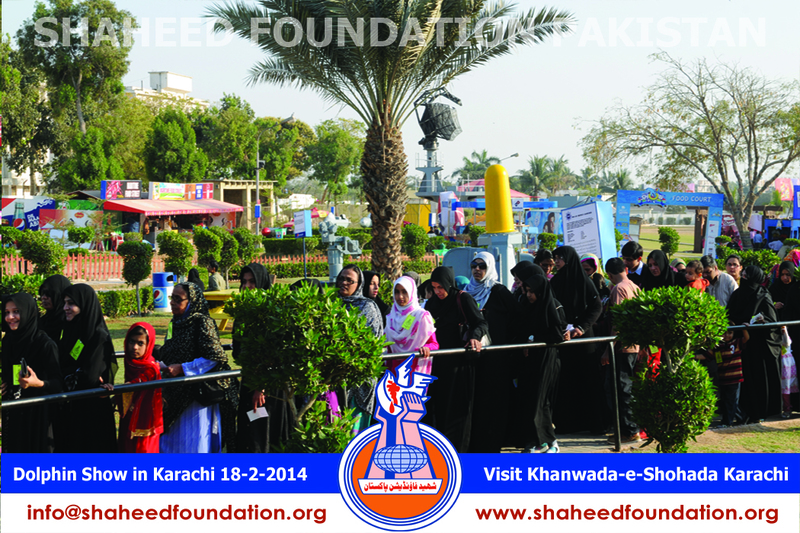 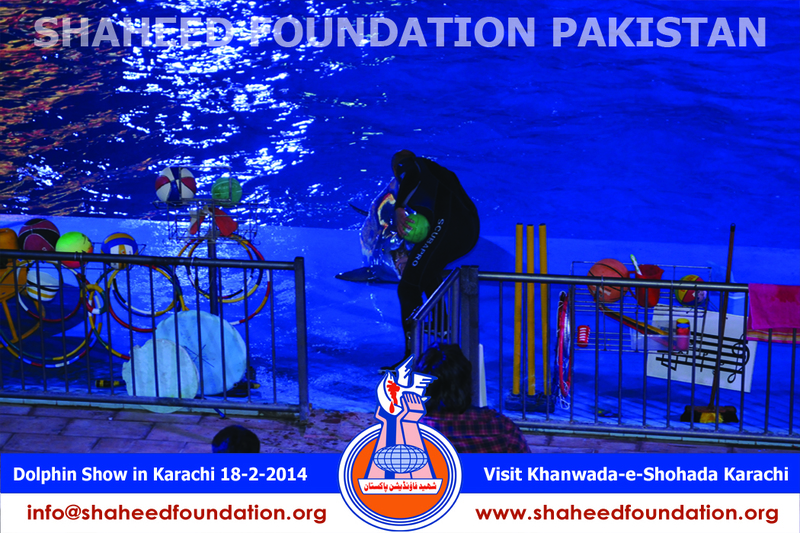 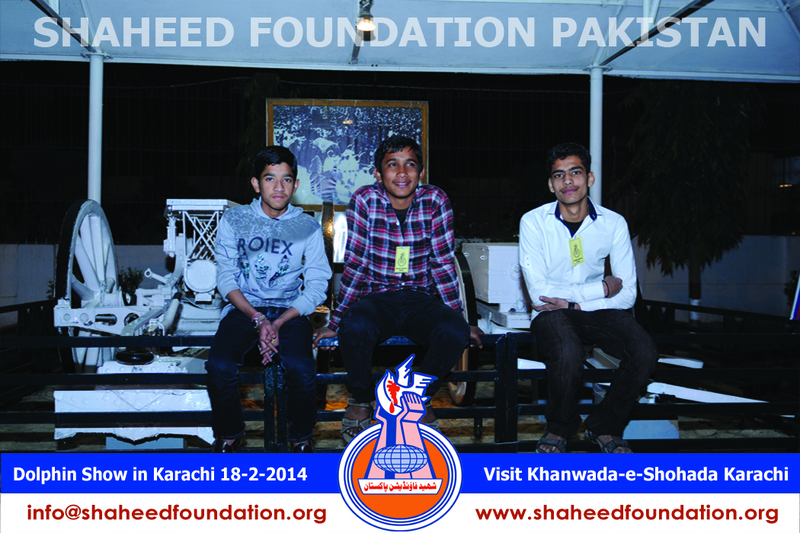 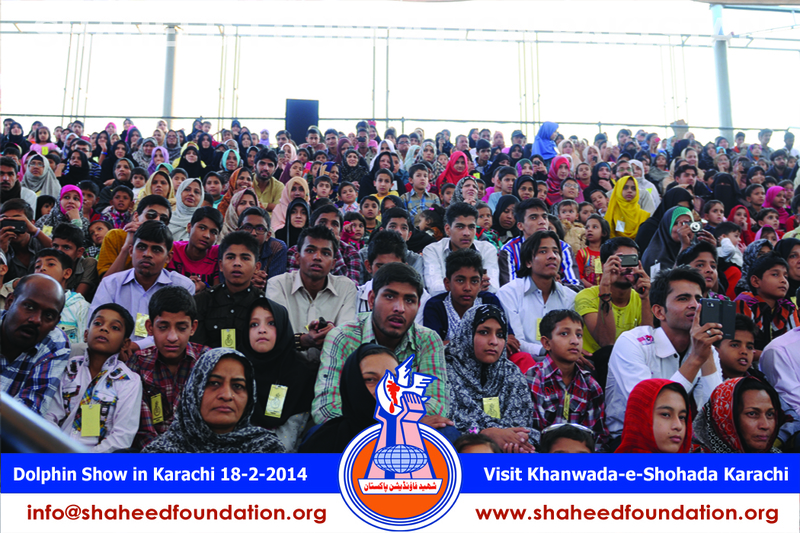 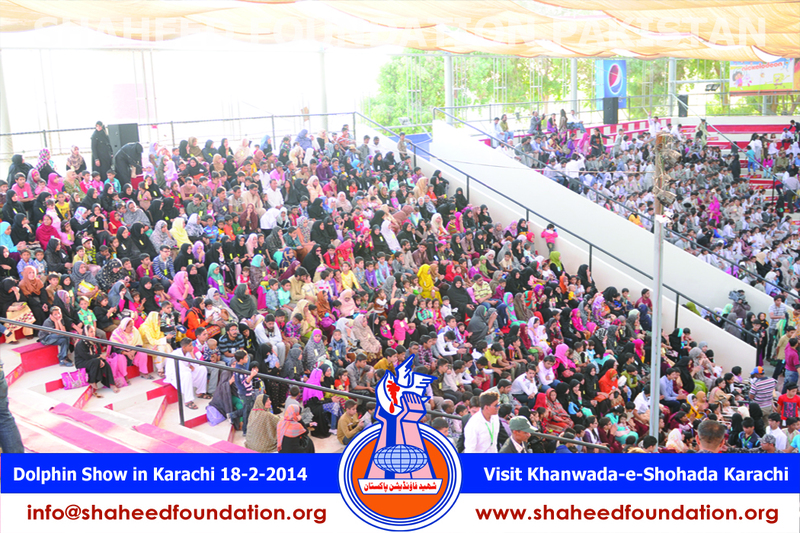 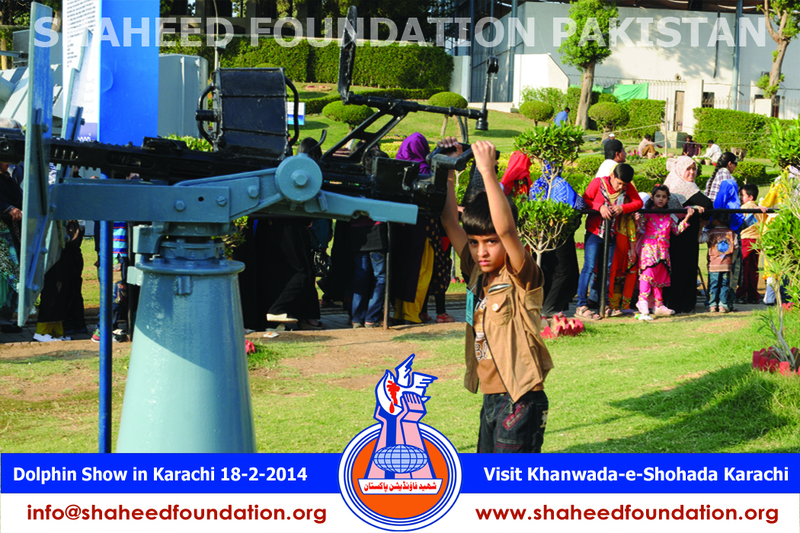 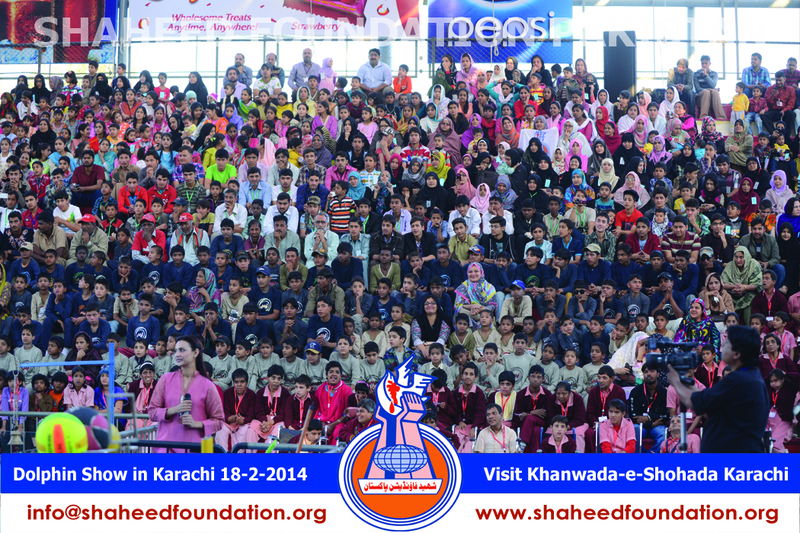 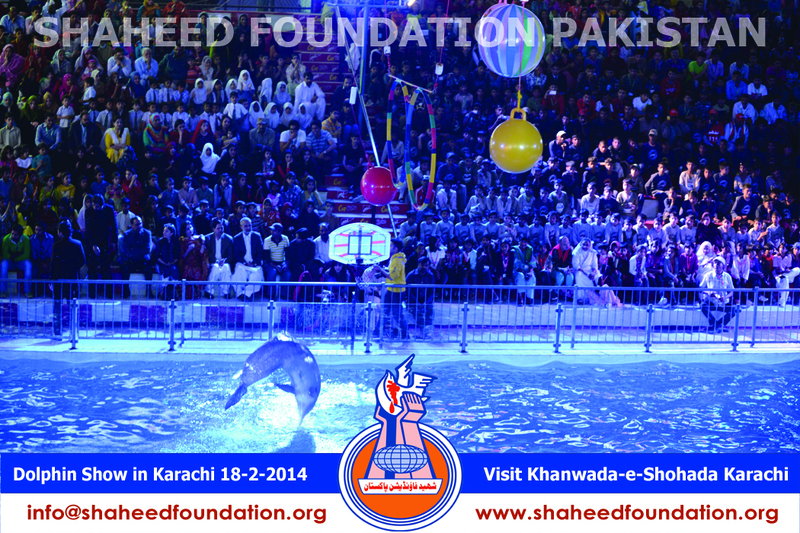 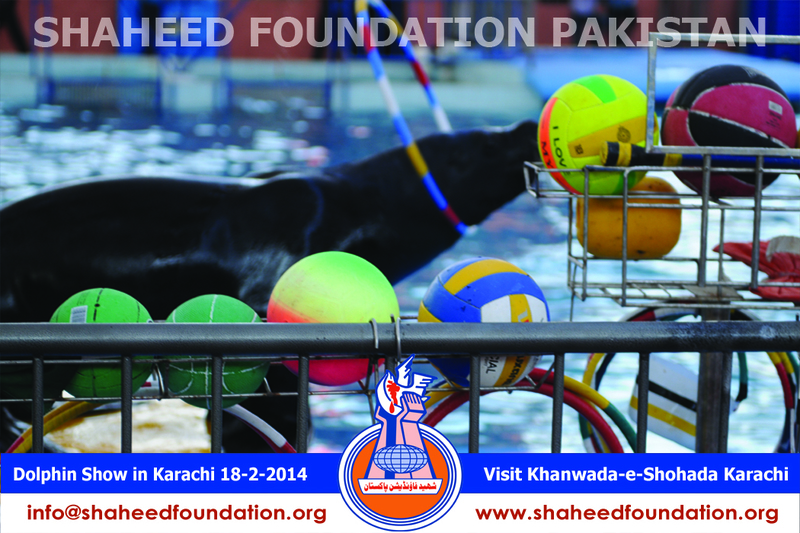 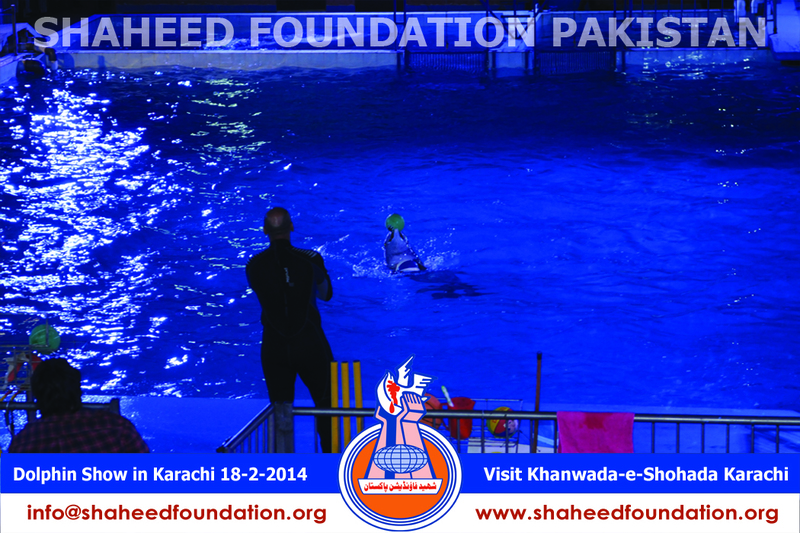 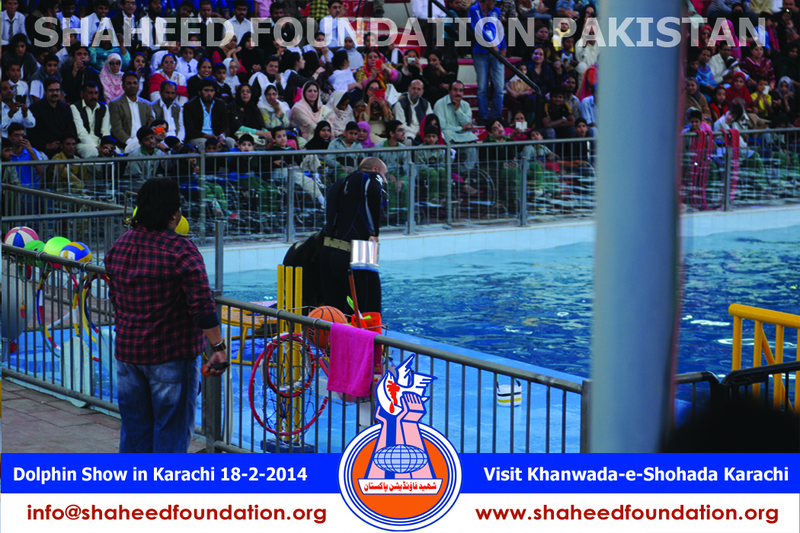 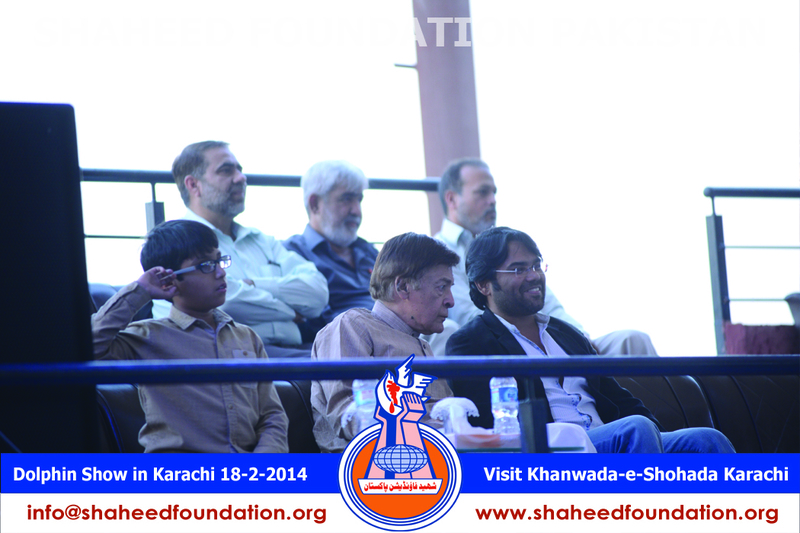 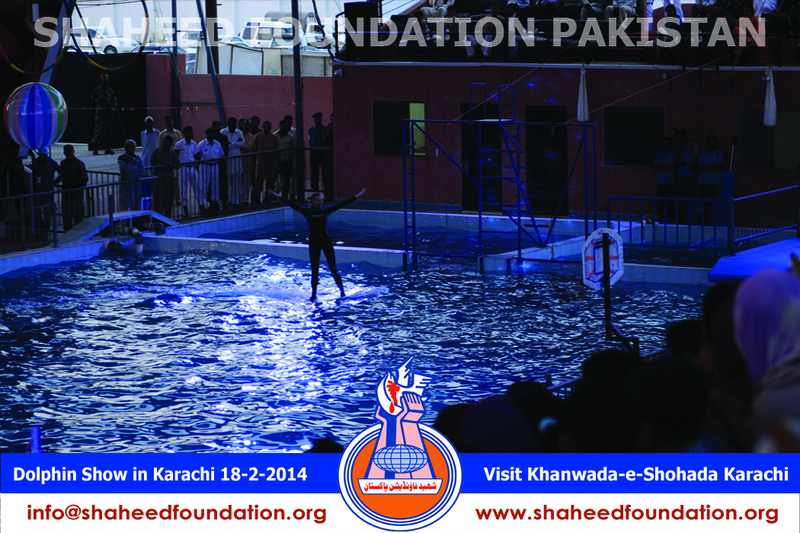 Shaheed Foundation Pakistan organizes various programs for families of martyrs throughout the year, to provide them healthy entertainment and enjoyment for providing mental comfort and facilitating interaction among families of martyrs. 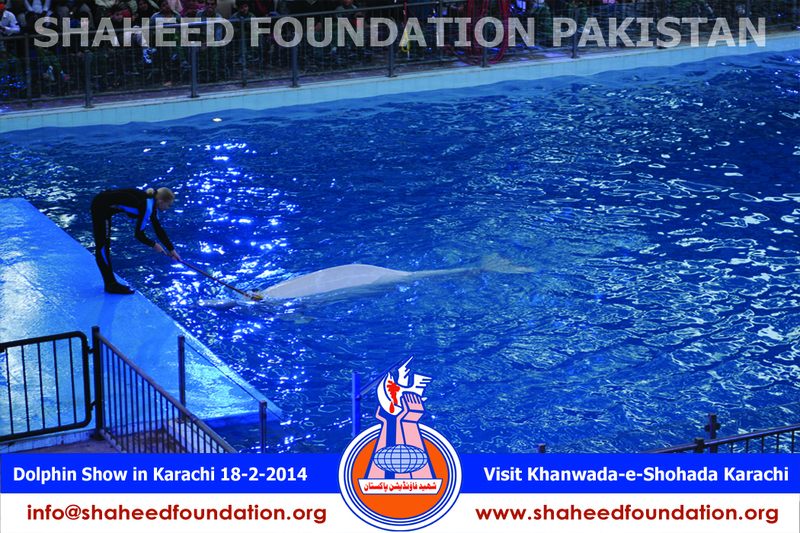 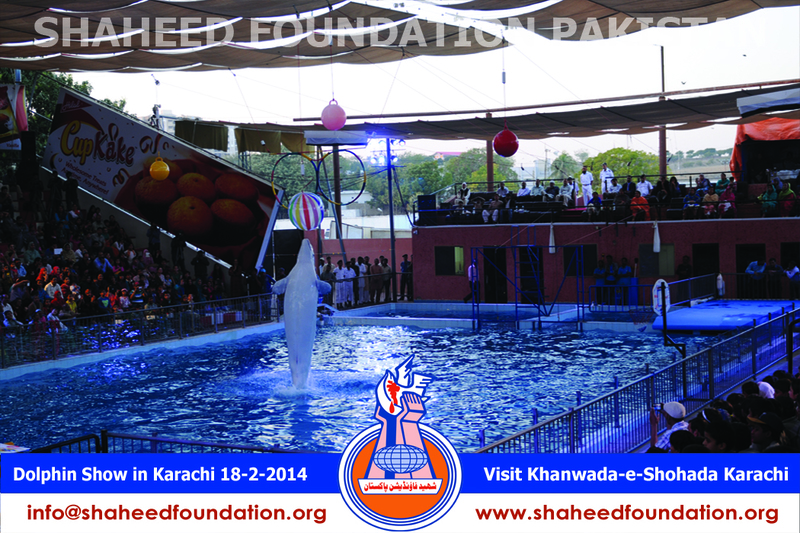 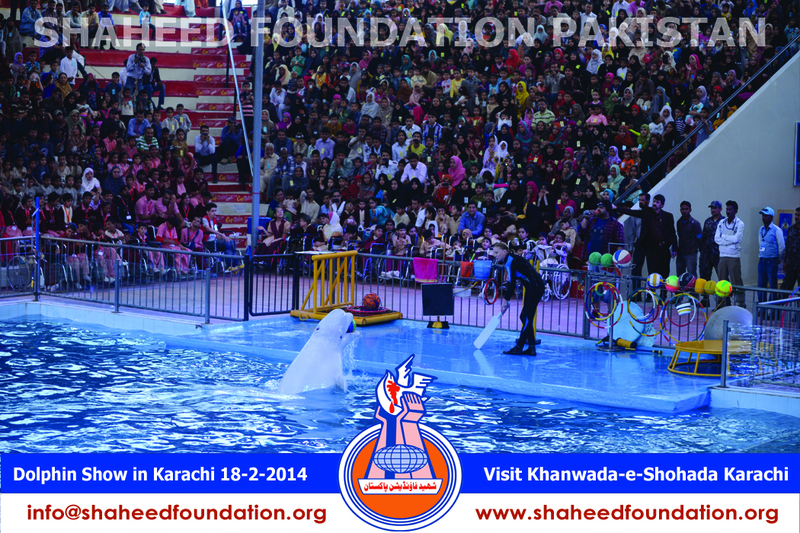 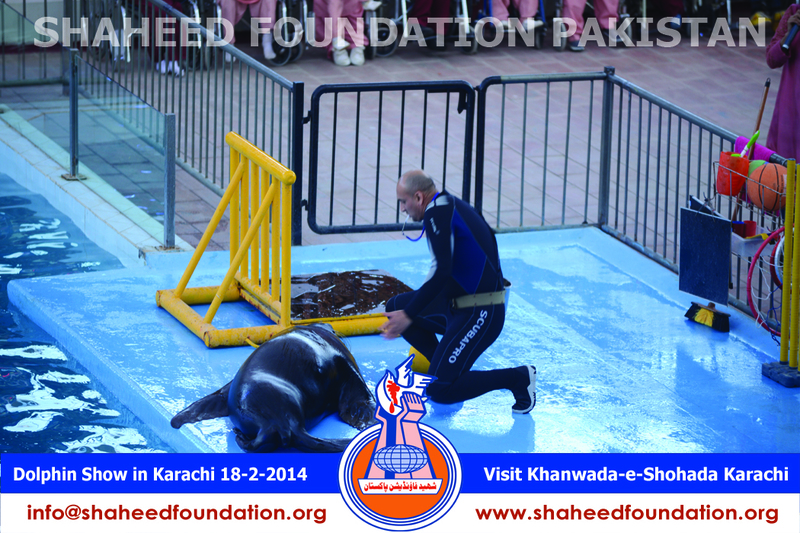 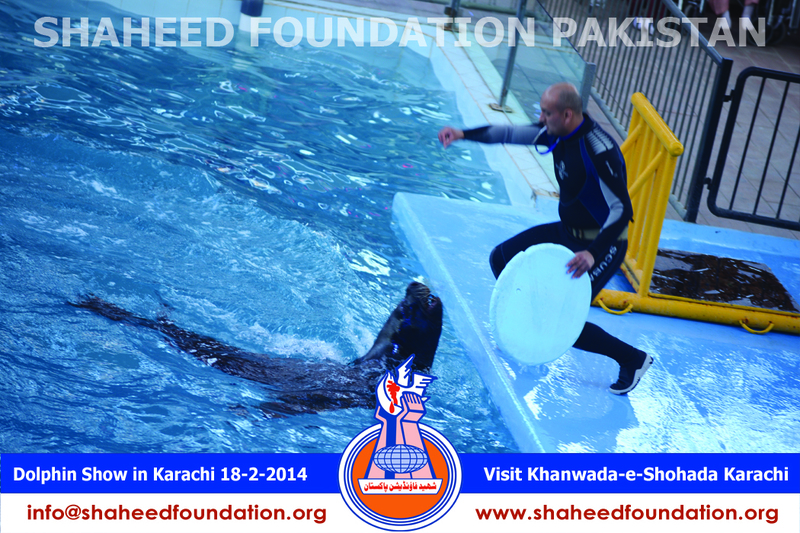 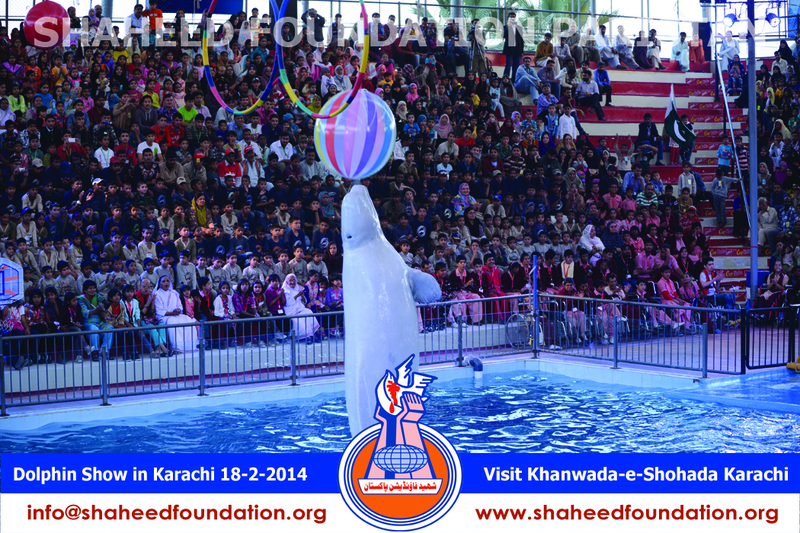 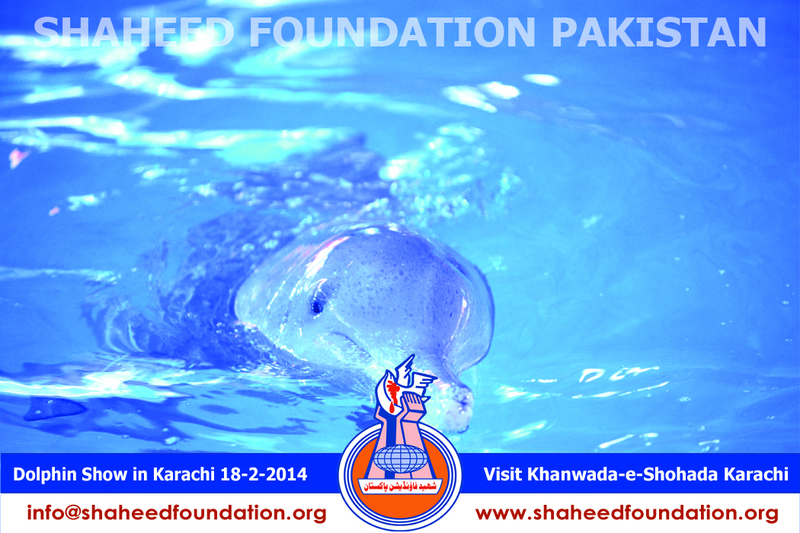 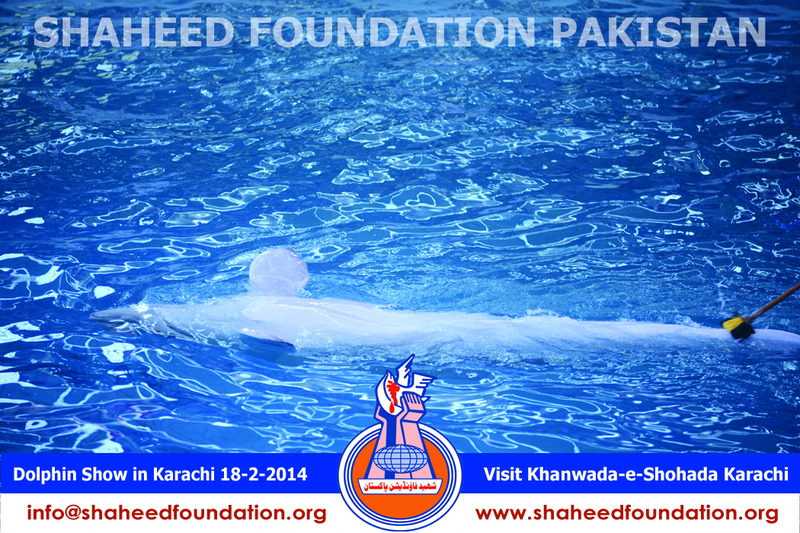 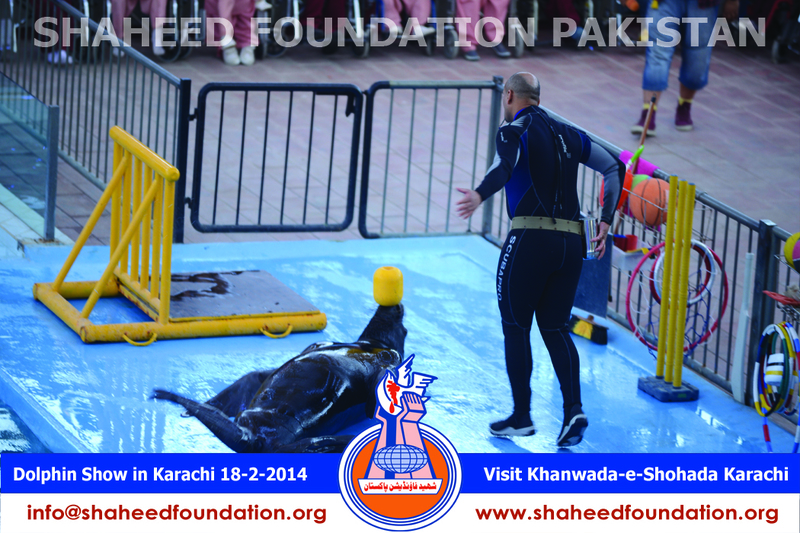 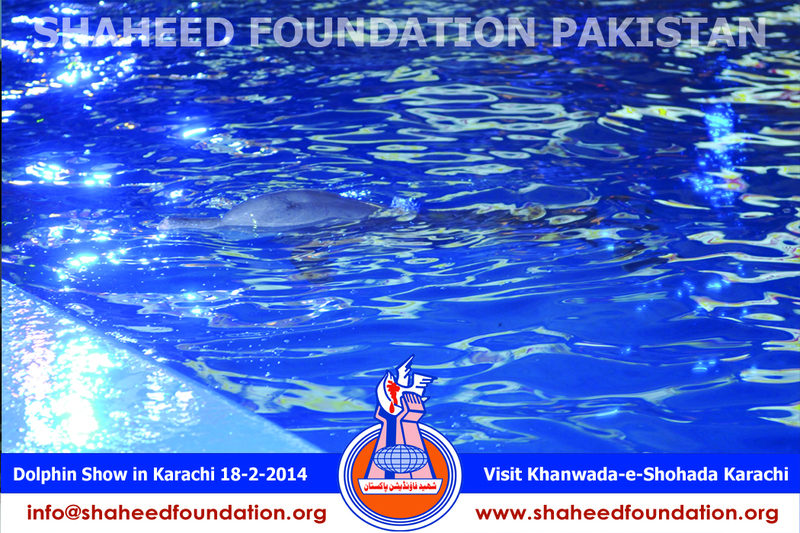 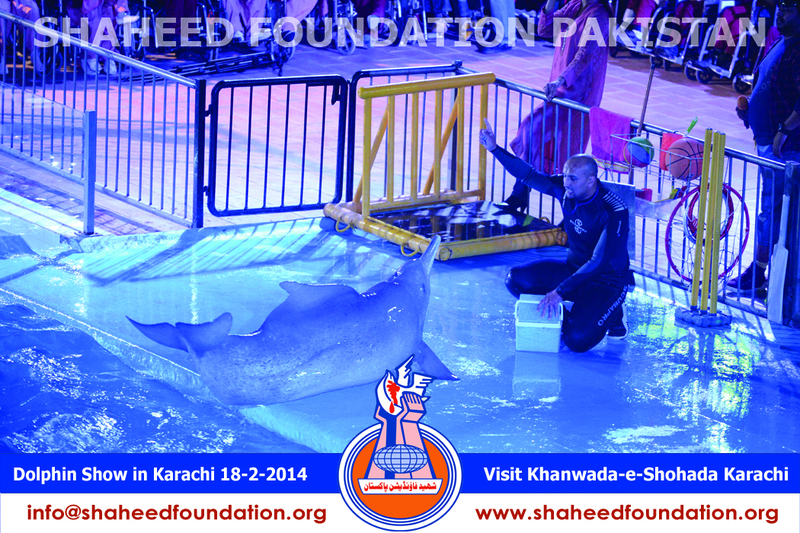 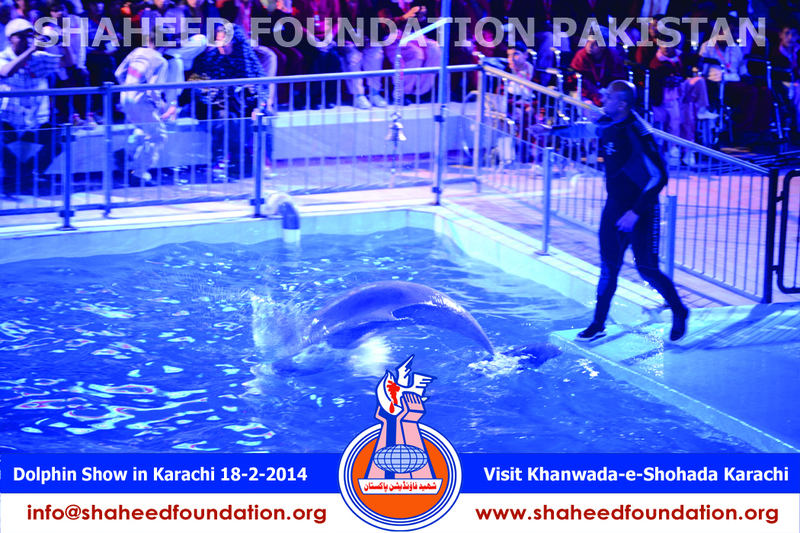 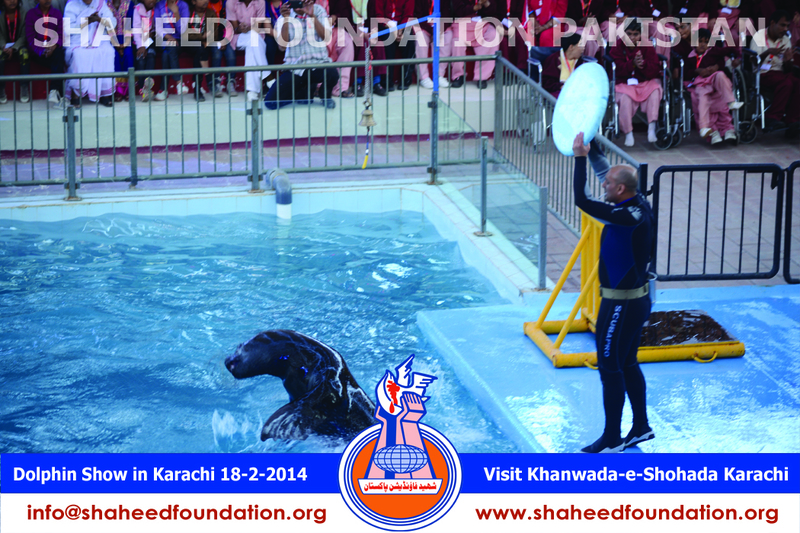 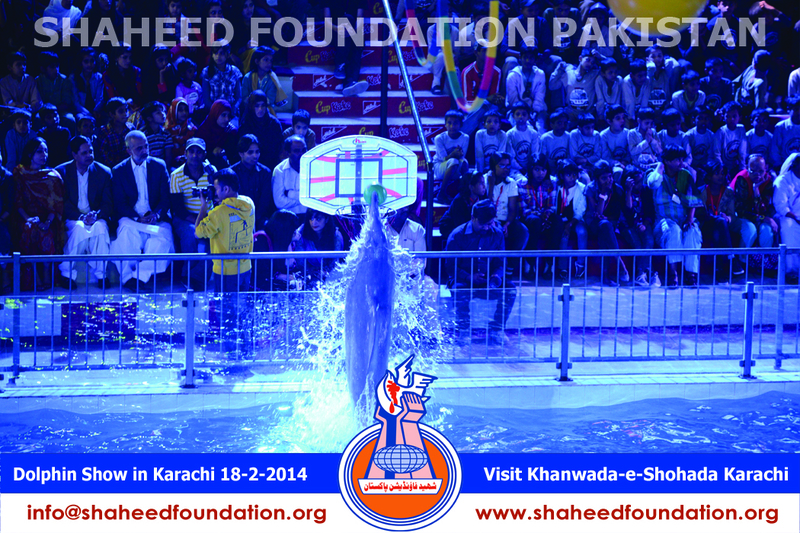 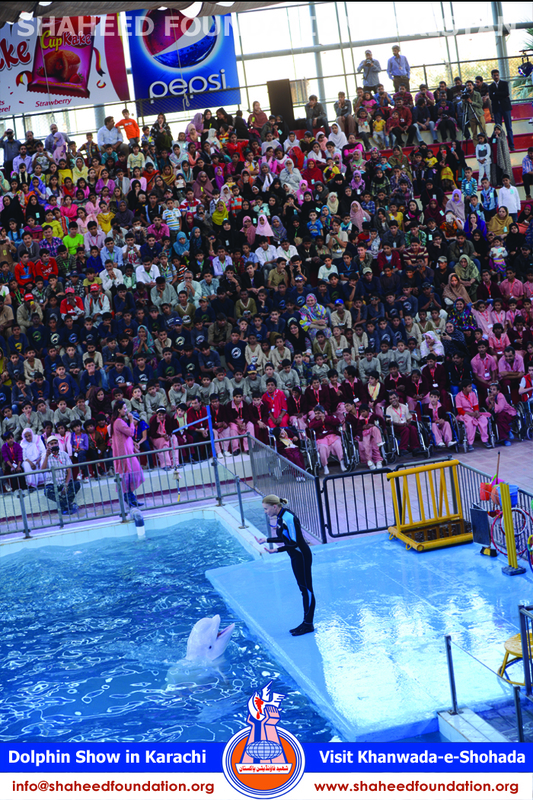 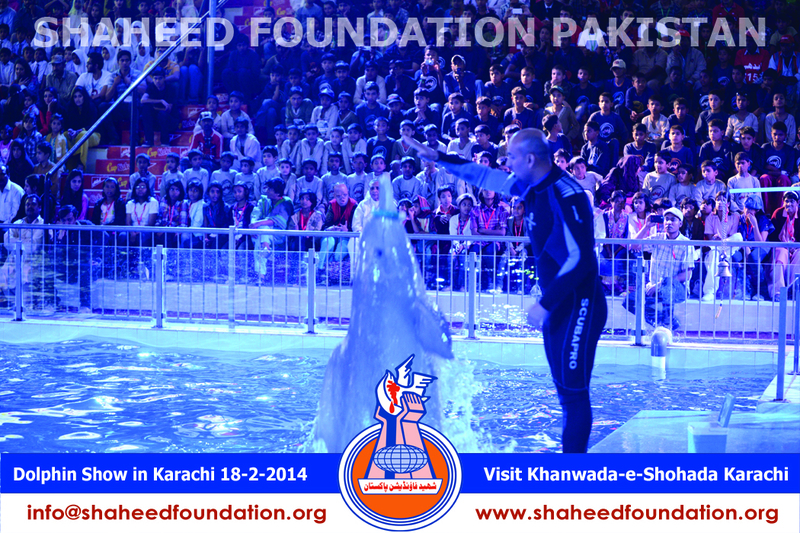 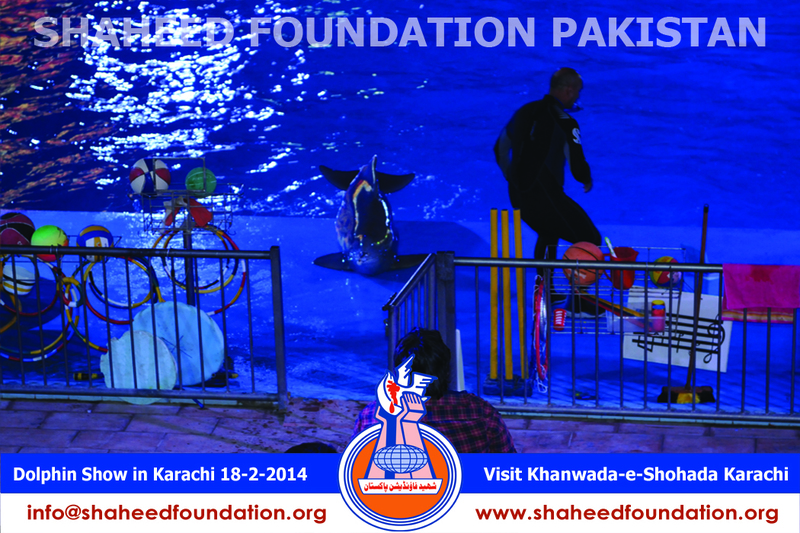 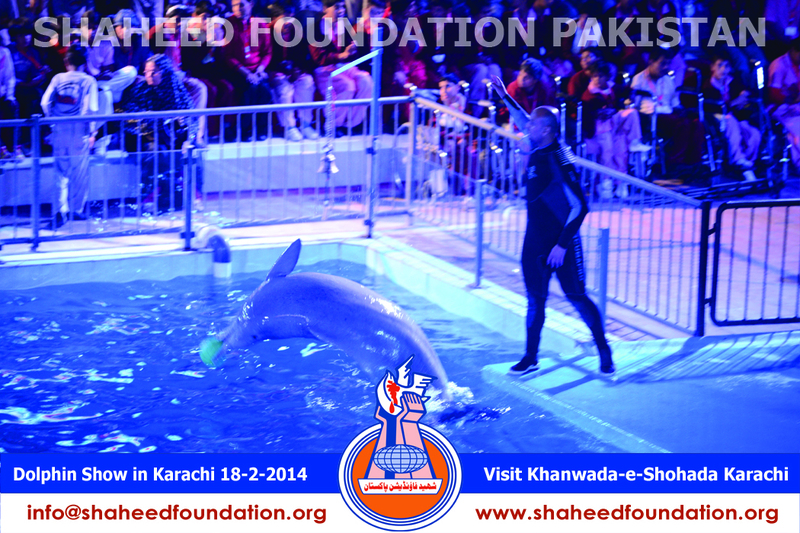 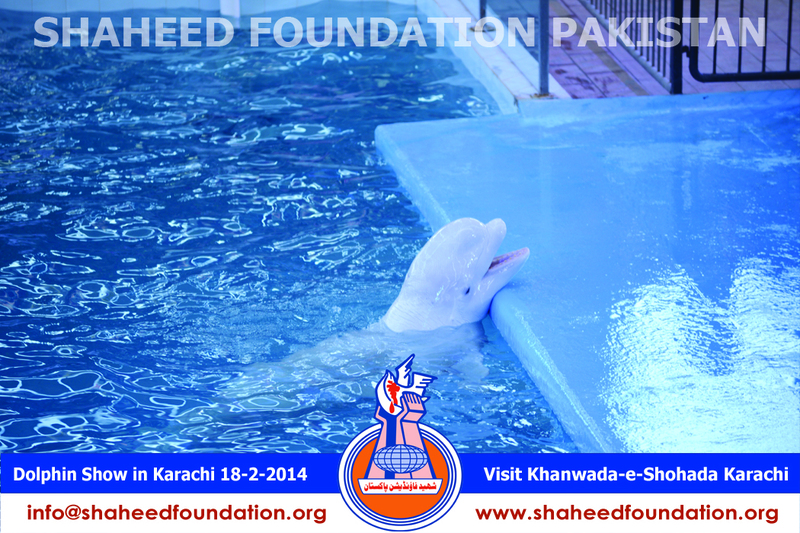 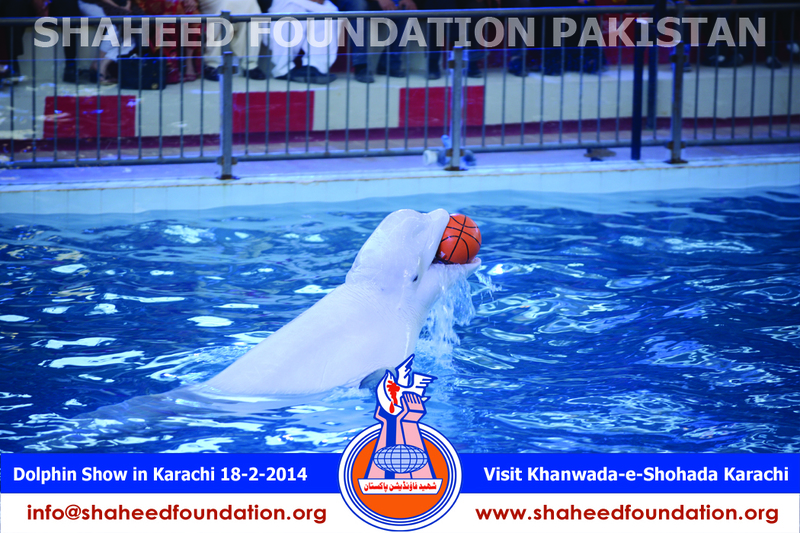 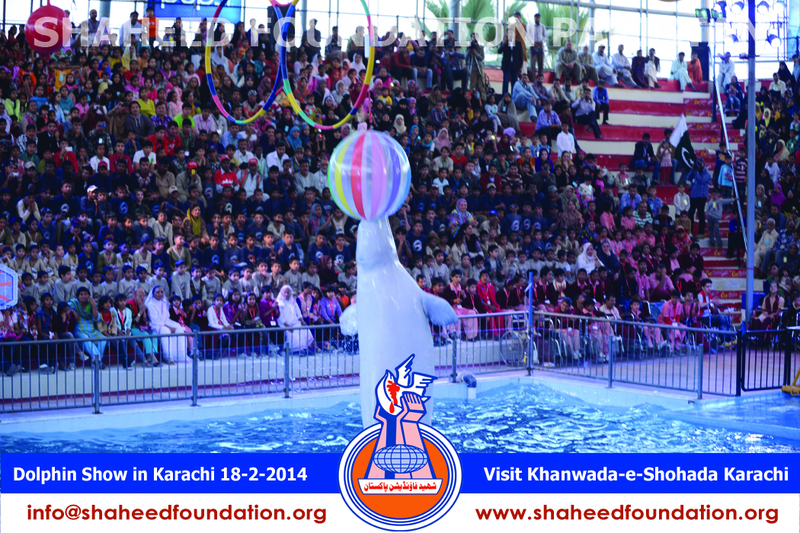 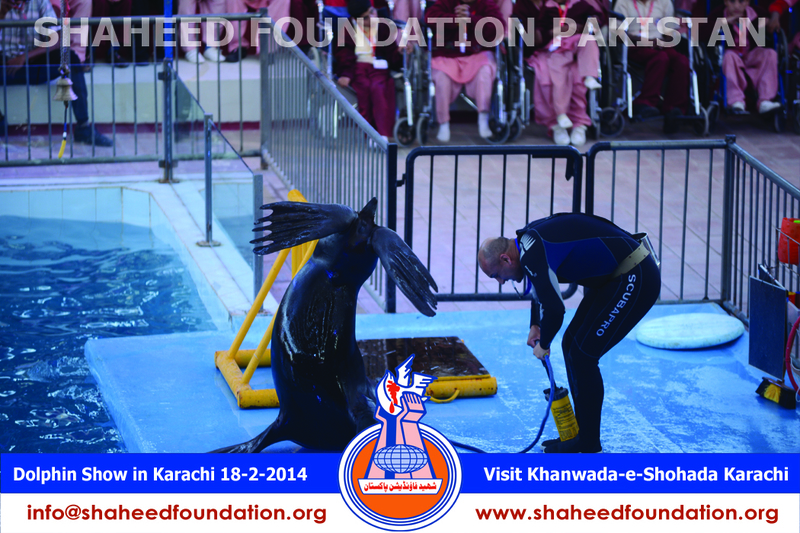 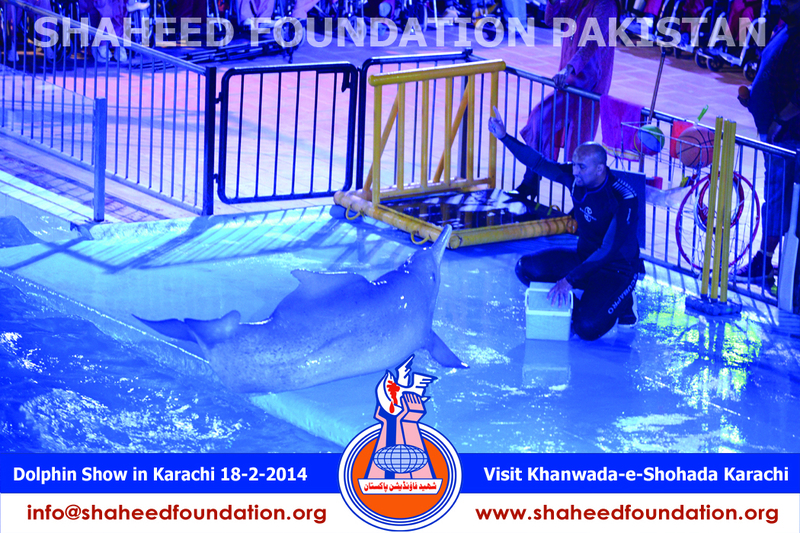 The Dolphin show has been organized by Dolphin Show International with the collaboration of Pakistan Navy within the premises of Maritime Museum in a purpose built environs of the Karsaz. 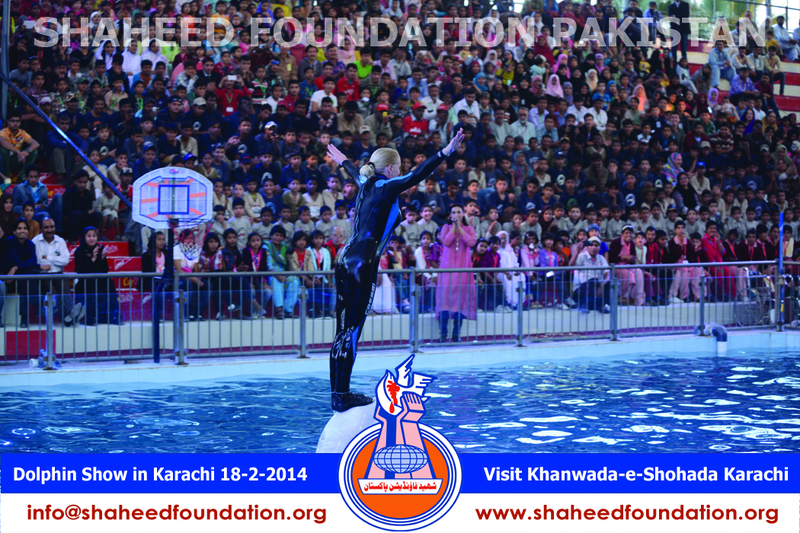 The magnetic attractiveness of the show especially drew the attention of children in the port city of Karachi . 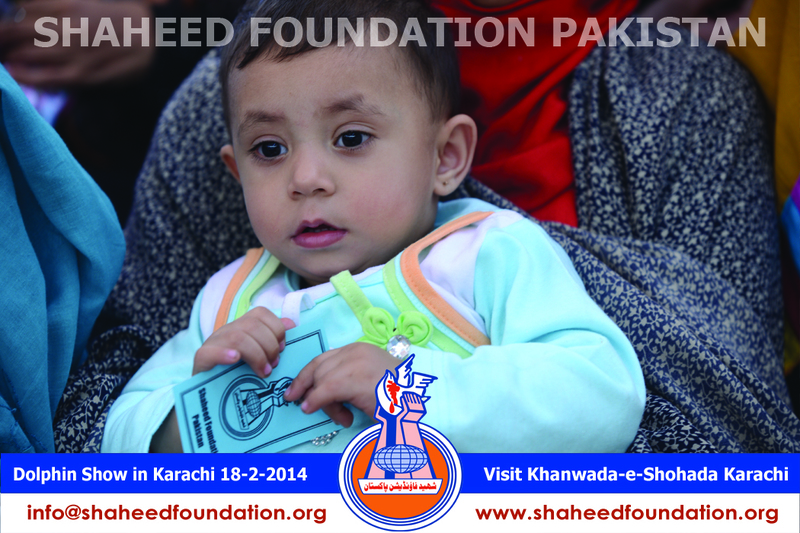 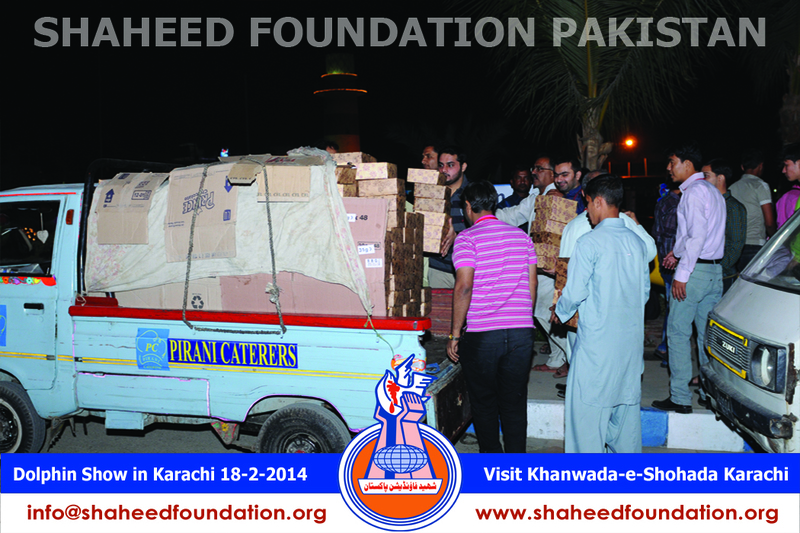 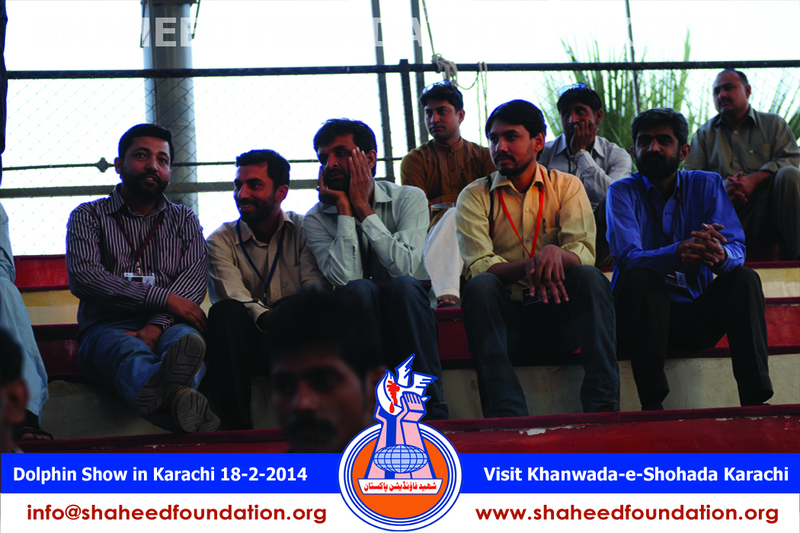 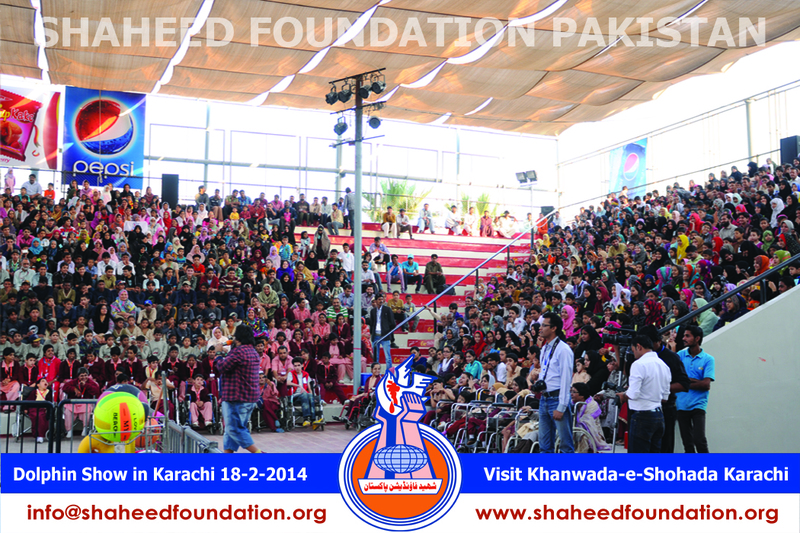 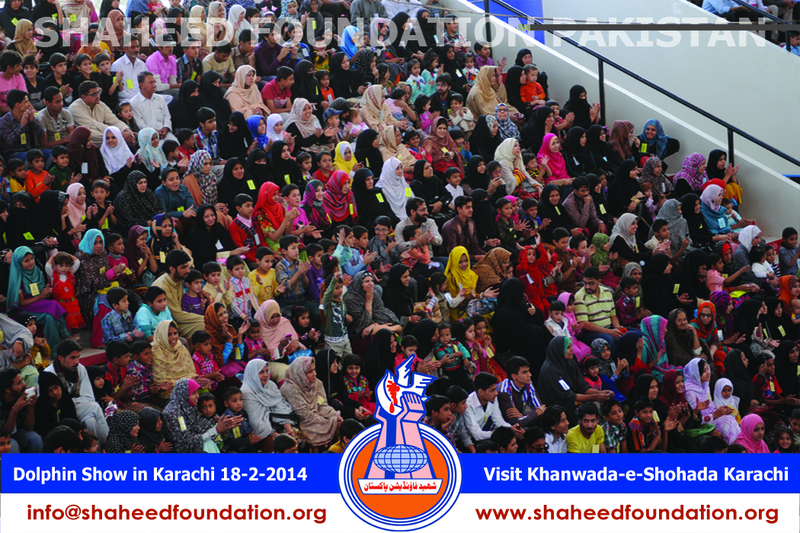 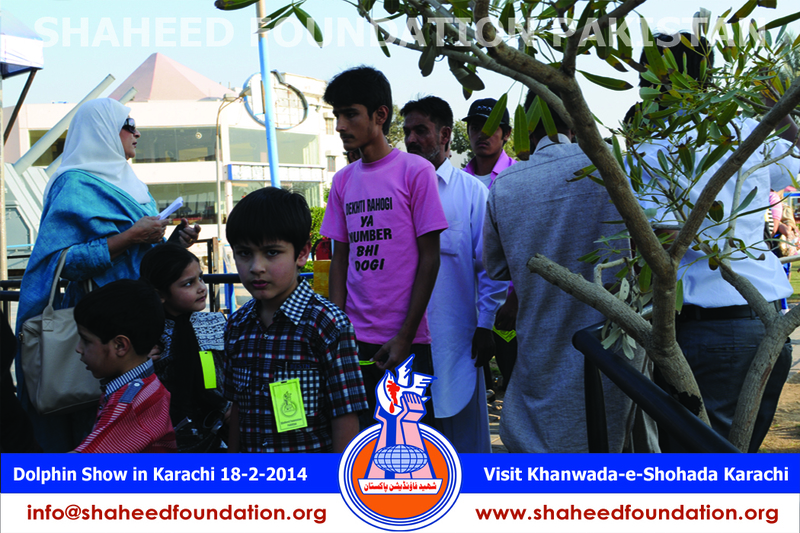 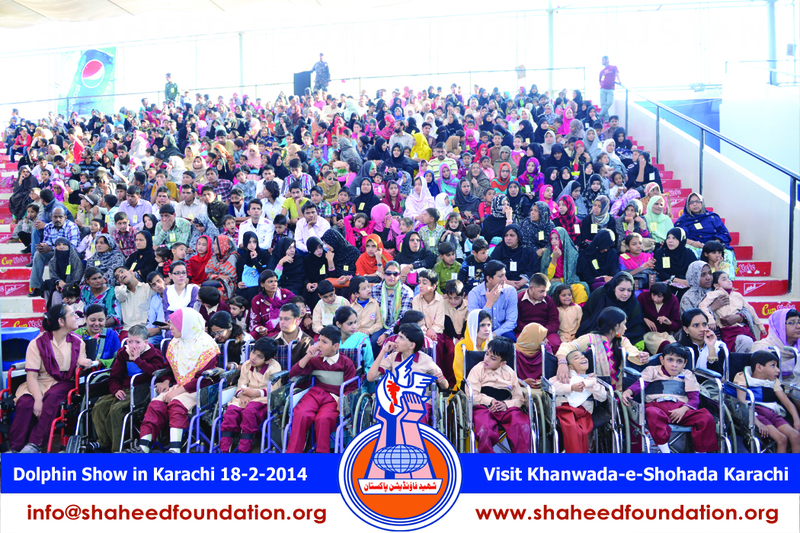 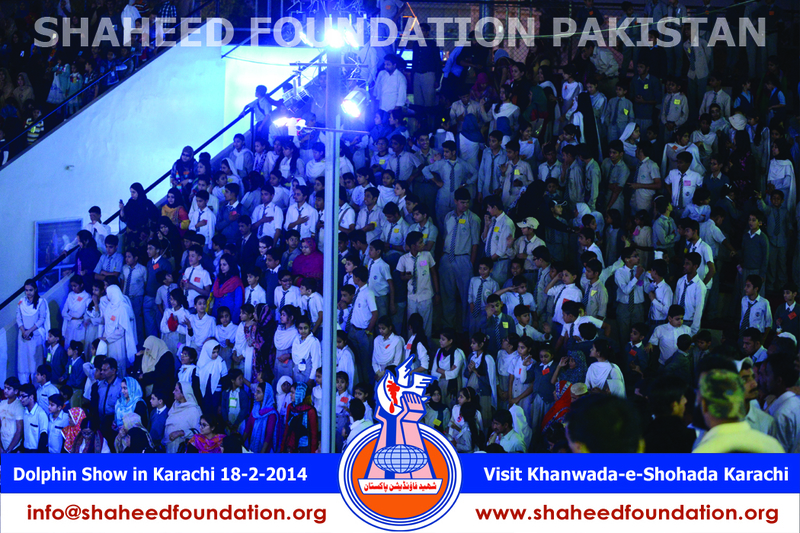 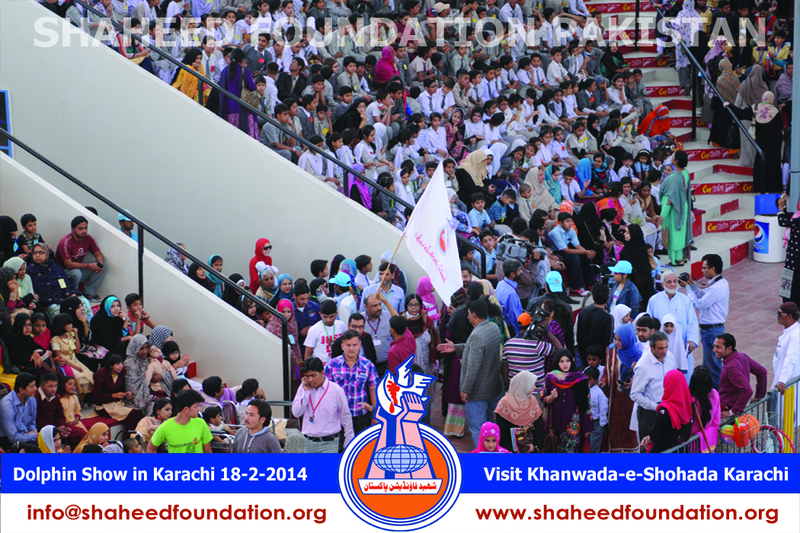 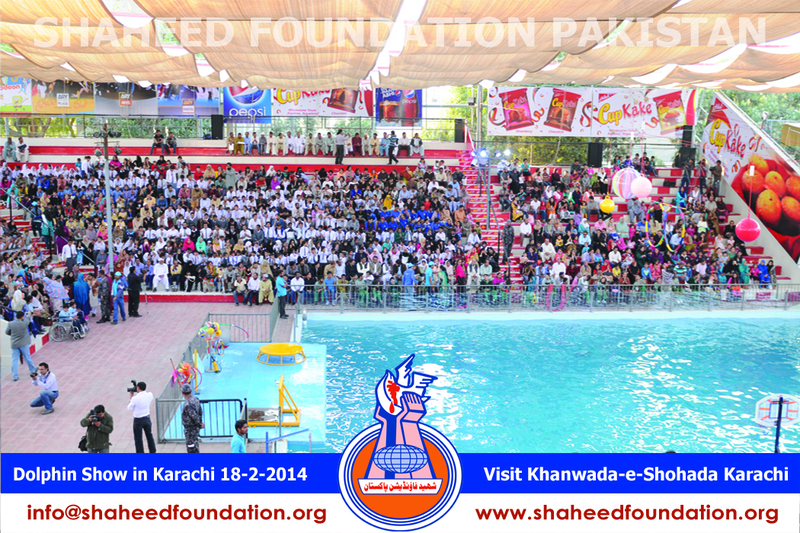 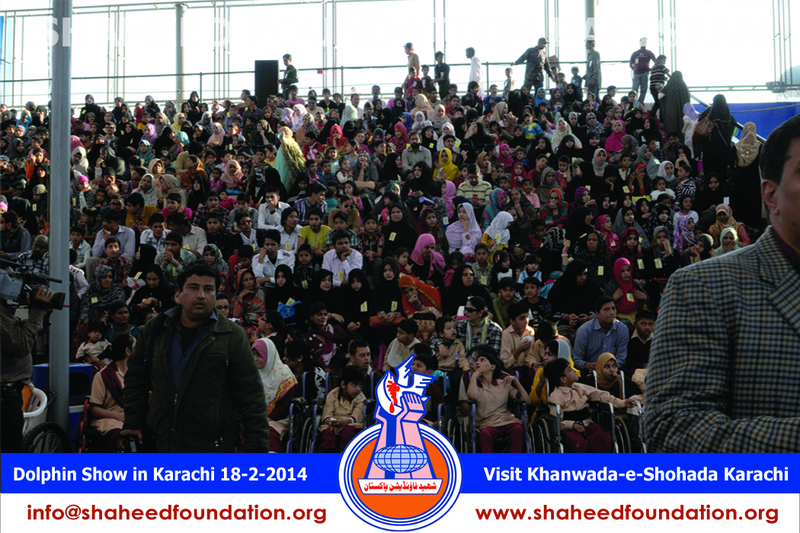 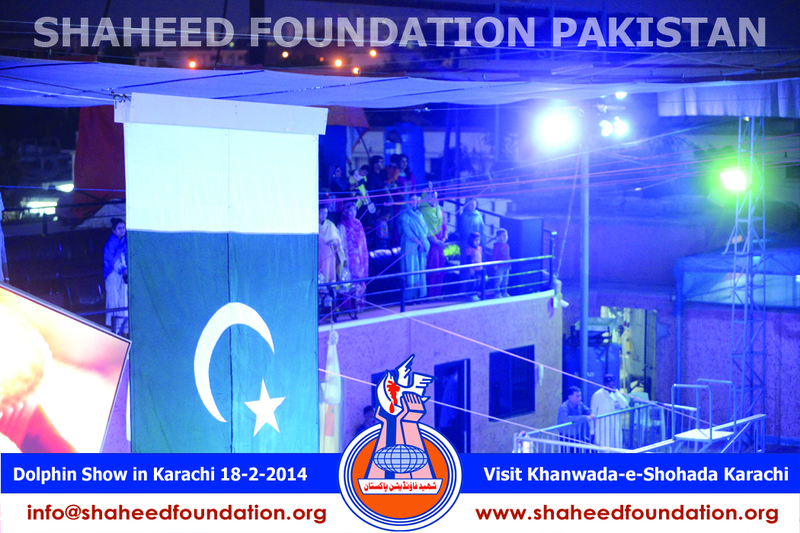 Seizing the moment for availing this unique opportunity Shaheed Foundation Pakistan collaborated to arrange the program on Tuesday,18th February, 2014 for innocent angels from the honourable families of beloved martyrs. 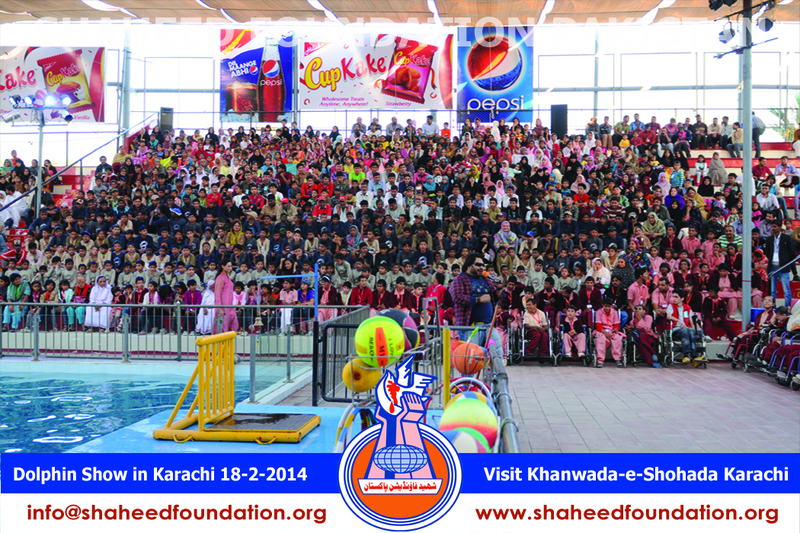 Approximately at 4 pm children gathered at the entry point of the maritime museum and afterwards got seated across the pool availing a quality seating arrangement . 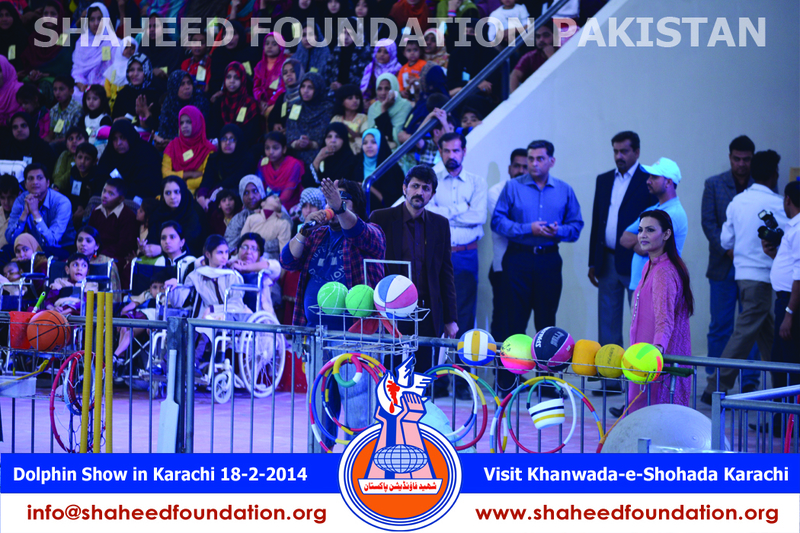 It is to be noted that the seating area was jam-packed with the audience in which handicapped children and special persons were prominent and made most of the entertaining show . 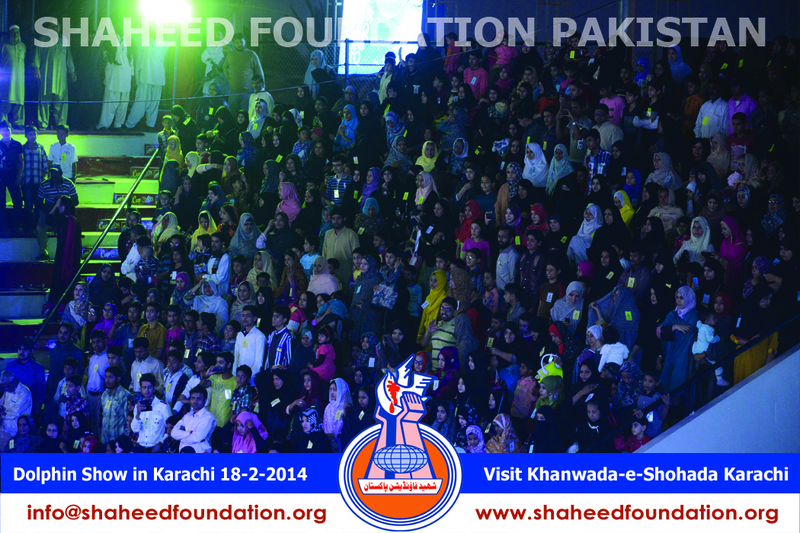 The show was initially conducted by Mr . Nadeem Jafery, a well-known television artist, along with Ms Sabeen Hasan who coordinated the show with him. 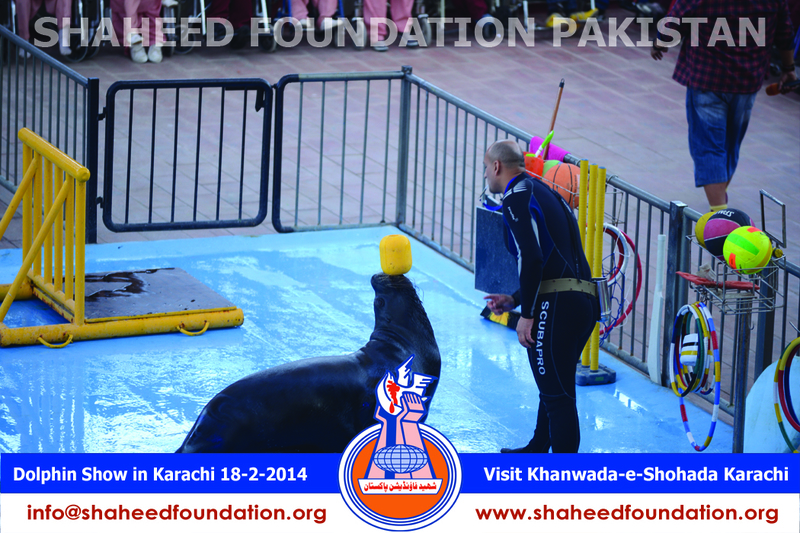 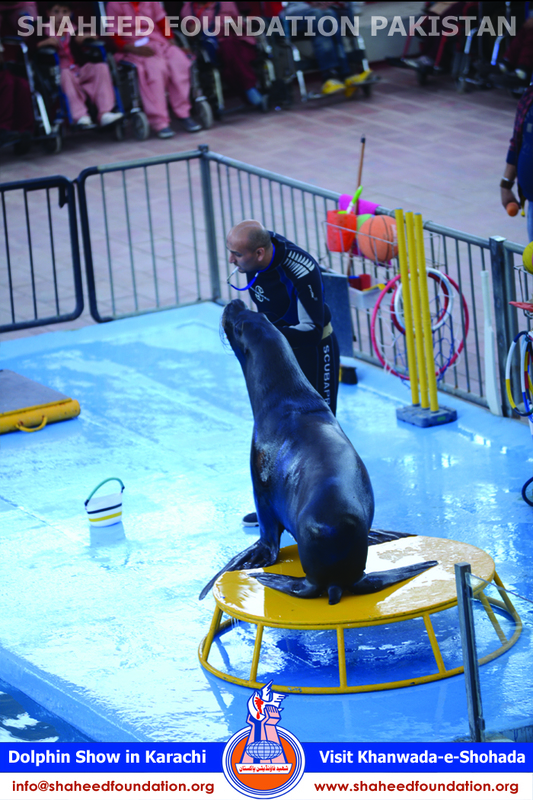 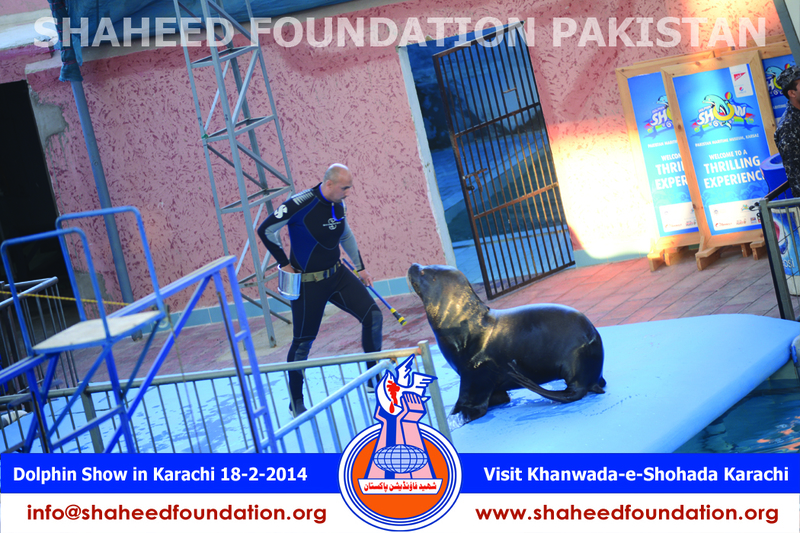 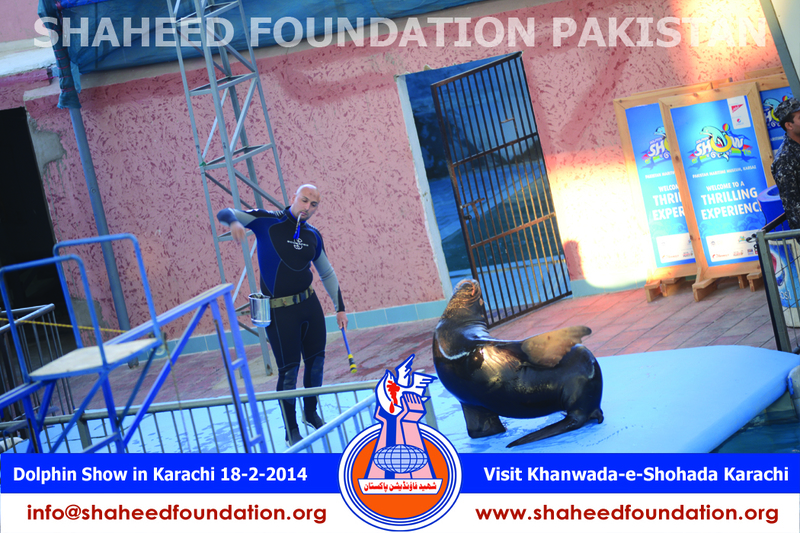 First of all sea-lion, nick named Memo, inaugurated the show by welcoming the audience through waving its hands.Its tricks and stunts won the hearts of children and received tremendous appreciation. 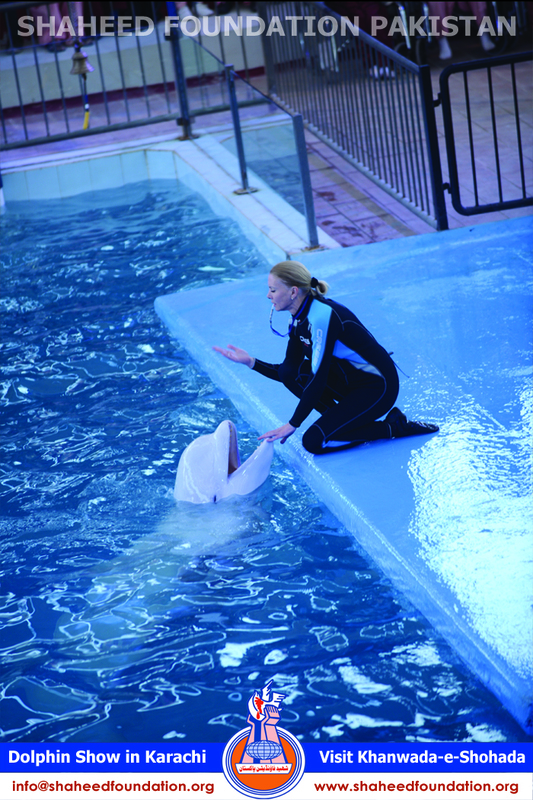 Afterwards, Stephen, the whale, appeared on the scene along its instructor from Russia,Ms. 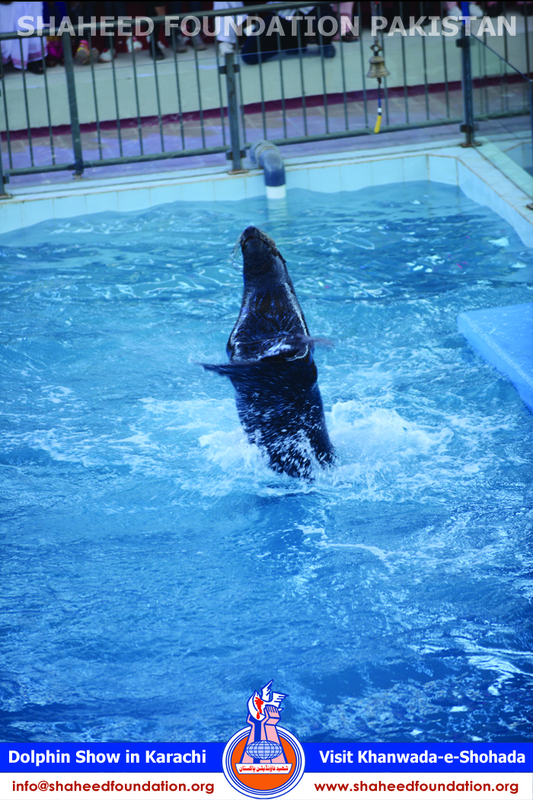 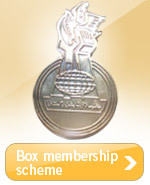 Inga. 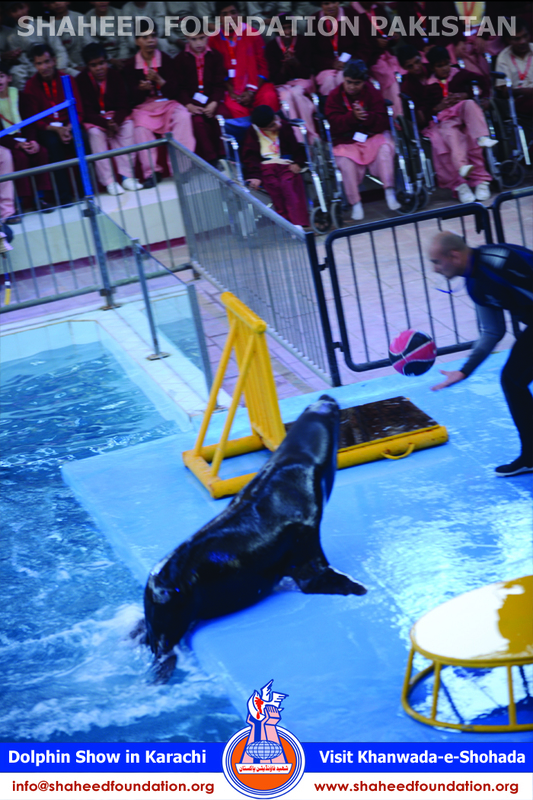 They also welcomed the audience as stephen waved fins and steadily got rhythm. 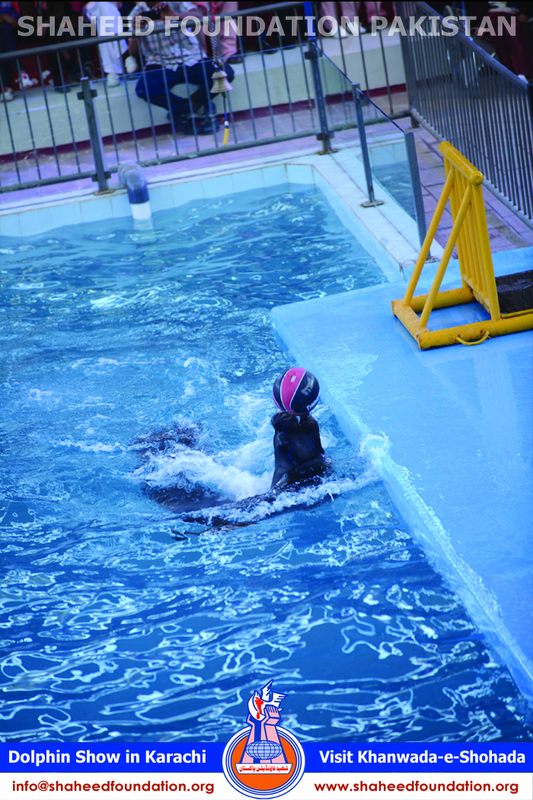 brushing the teeth, cleansing the body, playing friendly cricket, jumping out of the pool and hitting the balls dwindling in air, splashing back into the water . 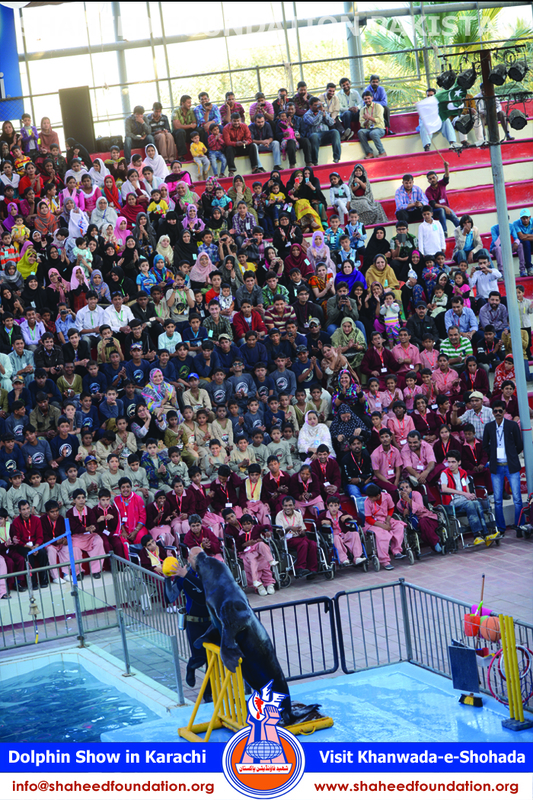 All these human like acrobats were impressive and made incredible sights. 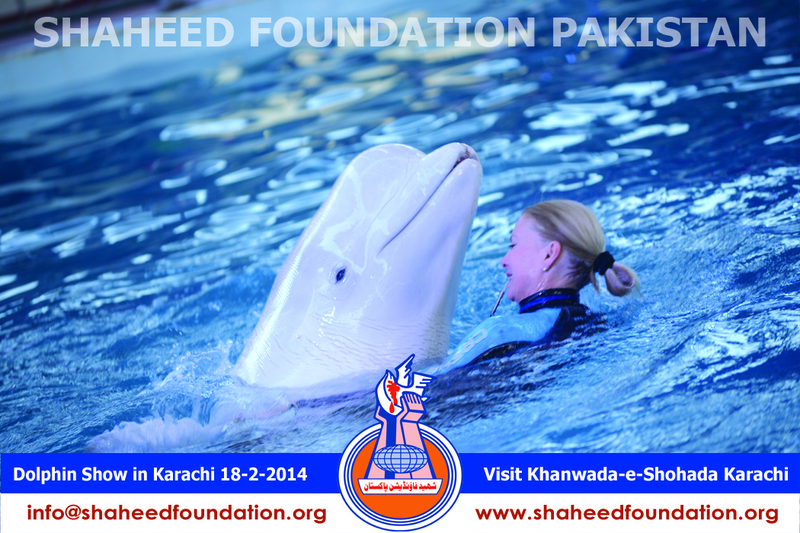 The smiling face and beautiful mannerism also is worth remembering..
After whale, at the peek of the climax, Dolphin came into the scene along his Egyptian instructor Fawwad Shareef. 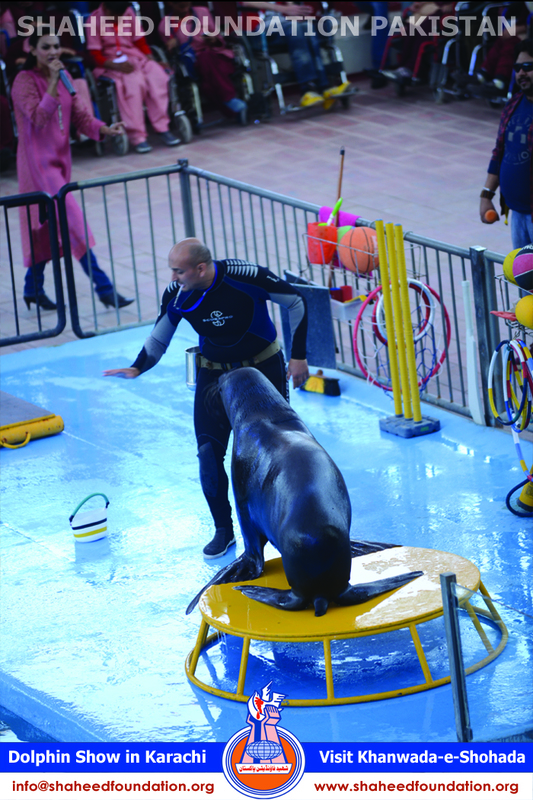 He performed well rehearsed stunts including crossing the tennis rope, playing; basket ball, freez-be, hitting the ball with tail in air space, which earned loud clapping and whistles. 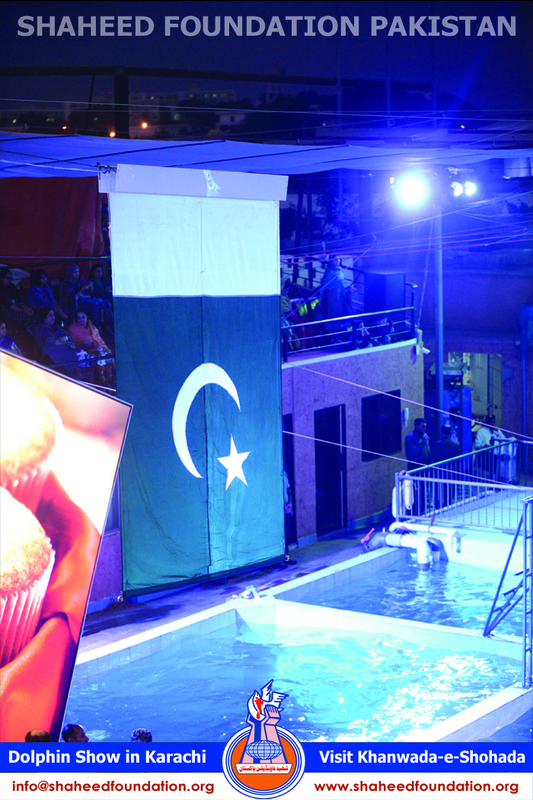 In last stunt, green crescent-star flag appeared at both ends of the pool which played national anthem. 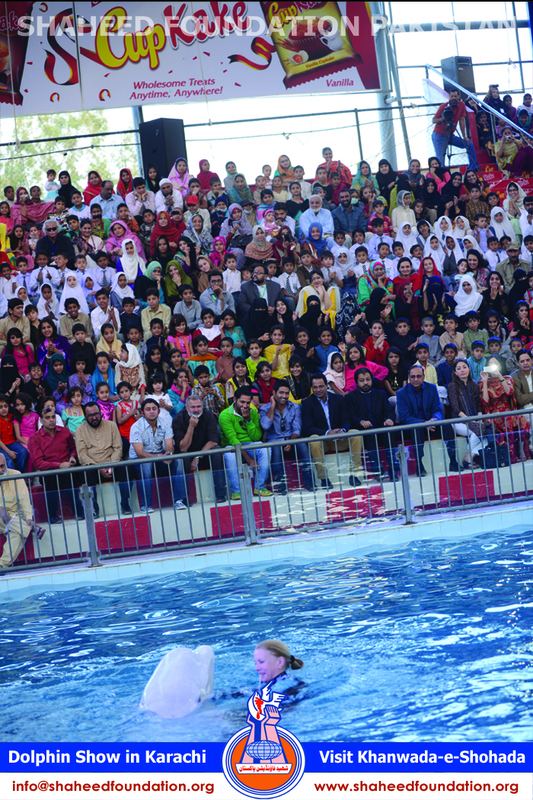 audience took part in reciting anthem with nationalistic enthusiasm and love in unison and also generously applauded the performers who had trained their mammals to perfection. 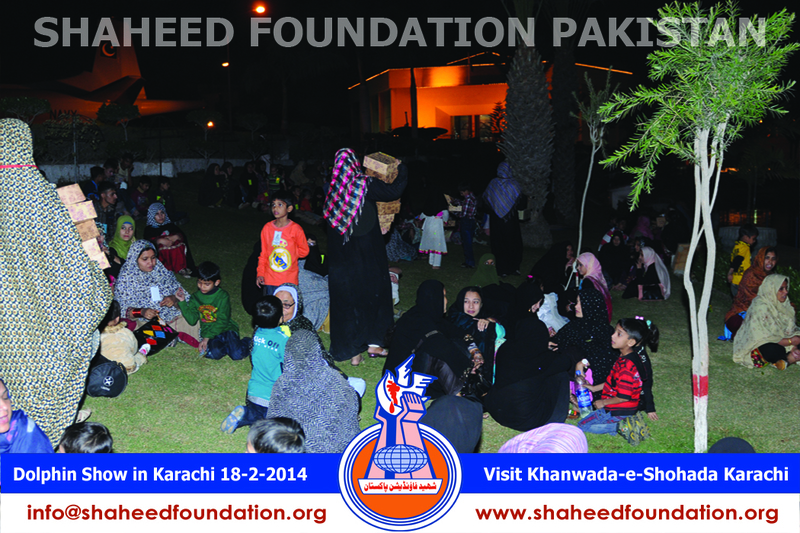 SFP honoured the guests with refreshment after which they were seen off along special regards for accepting the invitation of participation. 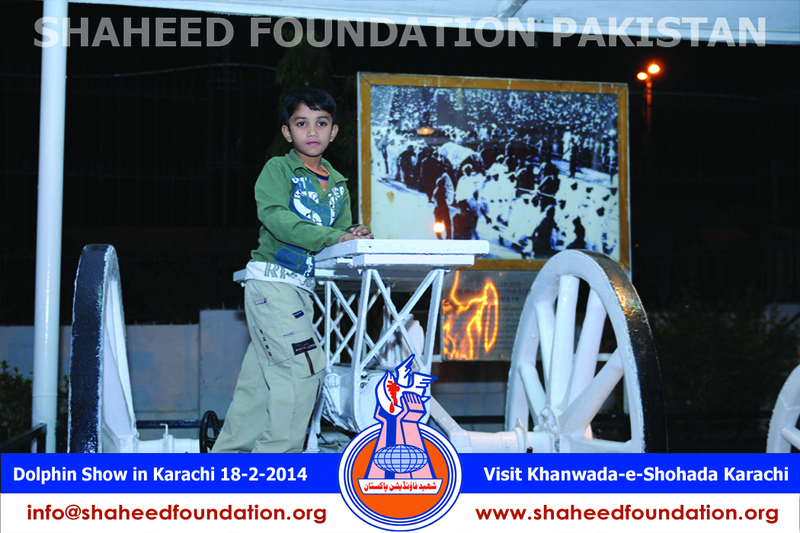 It is remarkable that children from martyrs families of some of very recent sanehat also participated honouring the request of SFP brothers . 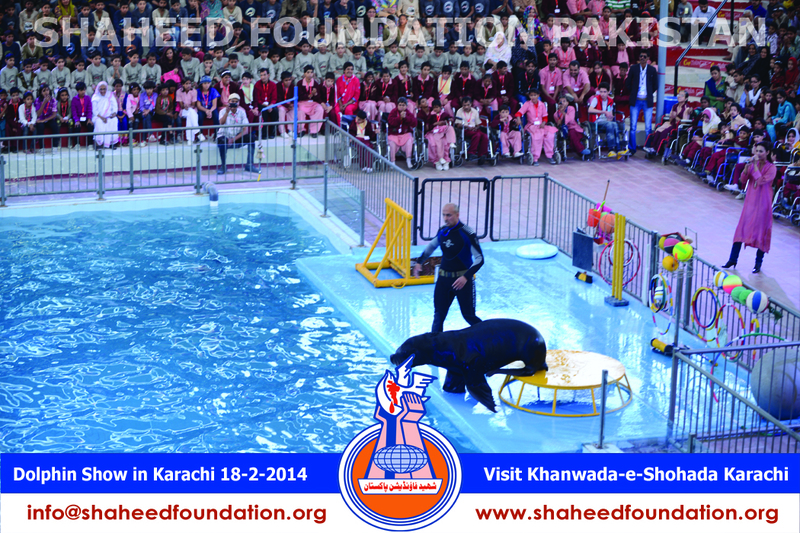 Shaheed Foundation also paid special thanks to Doplhin Show International for conducting such a great show and extending a cordial arrangement for collaboration for entertaining the innocent angels of the society . 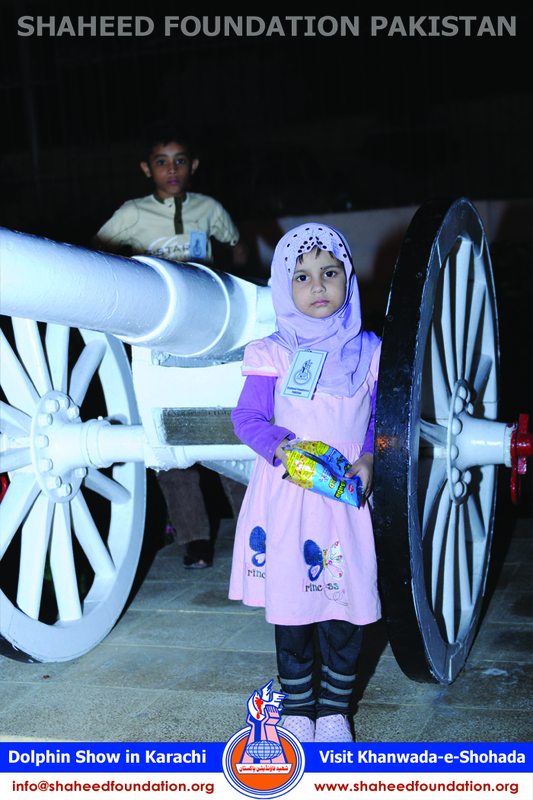 It is earnestly wished that they will continue there efforts to offer healthy entertainment to the people of Pakistan especially children to whom this society owes a lot like the special children . 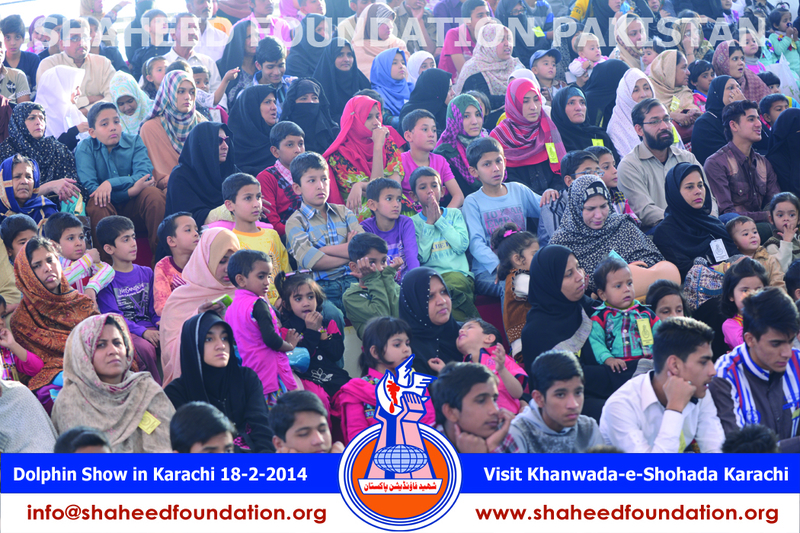 We also beseech Imam-e-Zamana [atfs] to pray for bestowing everyone, who's done any efforts in this collaborative activity to bring smiles on the faces of the children of our benefactors with the choicest blessings of this world and the here-after.